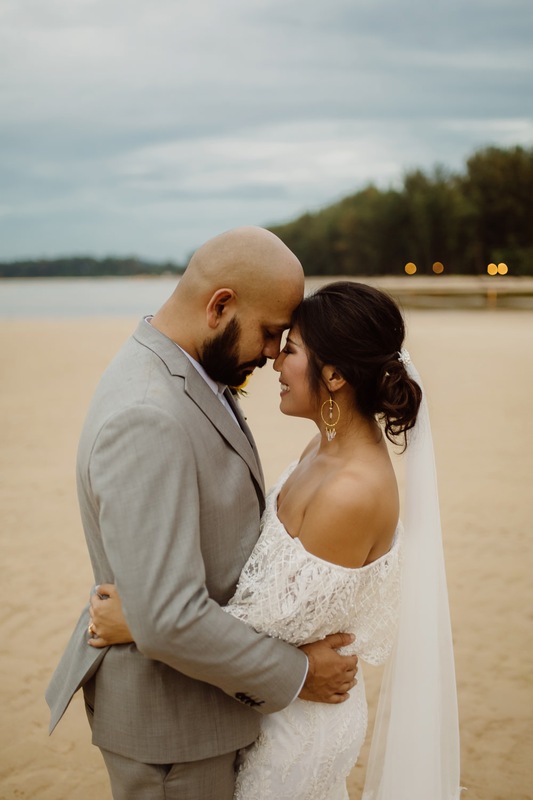 Once upon a December a lovely couple took my breath away. 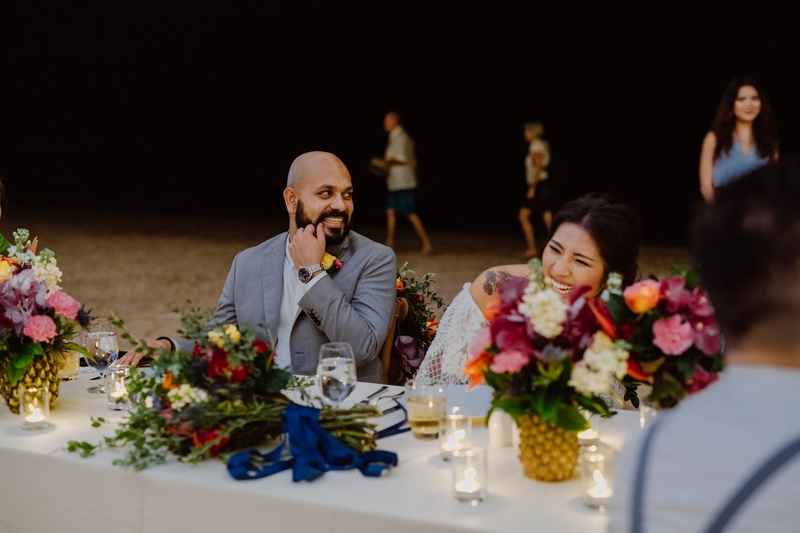 It was quite a change of pace for me to spend an otherwise cold and sometimes snowy month in such a warm and sunny place. 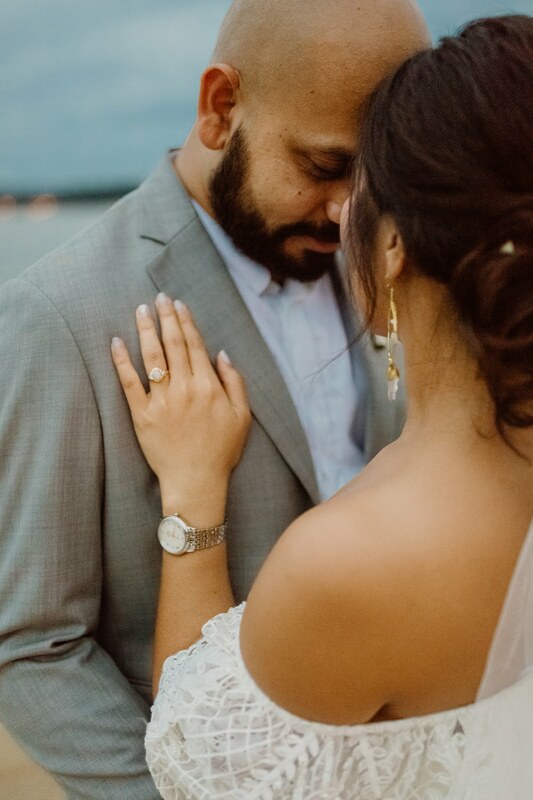 And I have to say that the sun was not the only thing that made me feel warm. 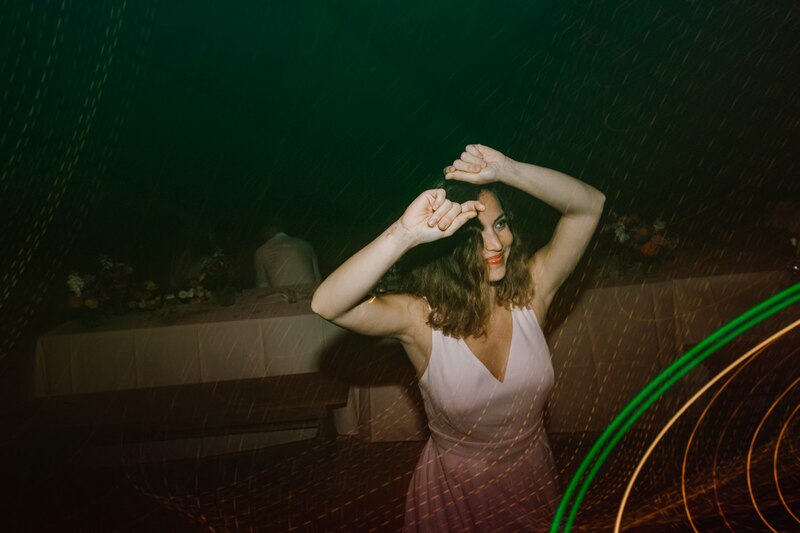 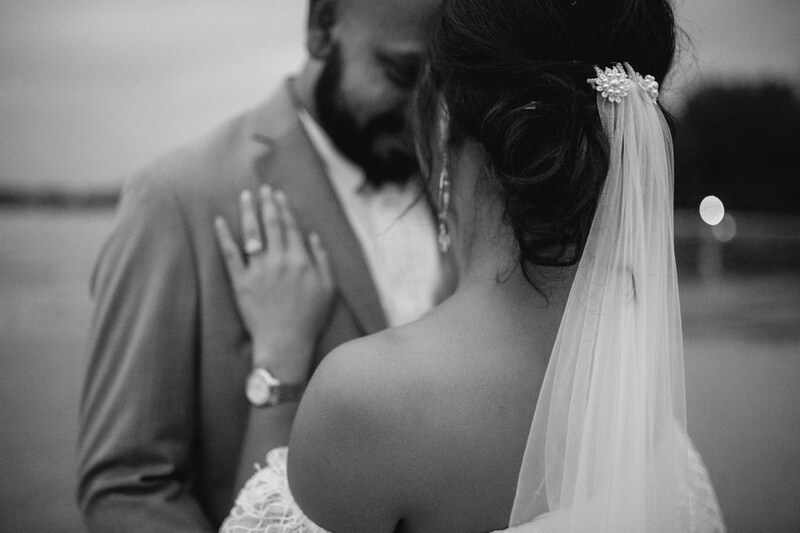 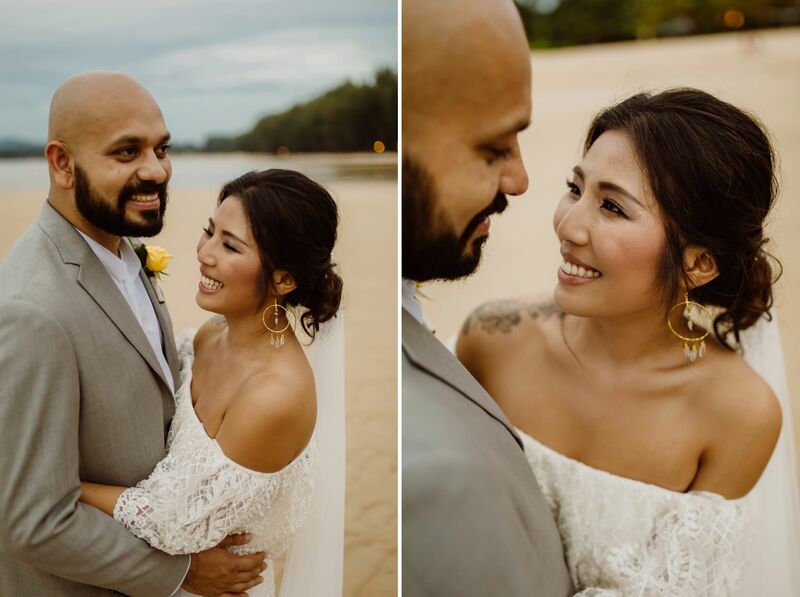 I met Tarn and Sri about a year before their wedding and at that point had no idea that I would be their photographer. 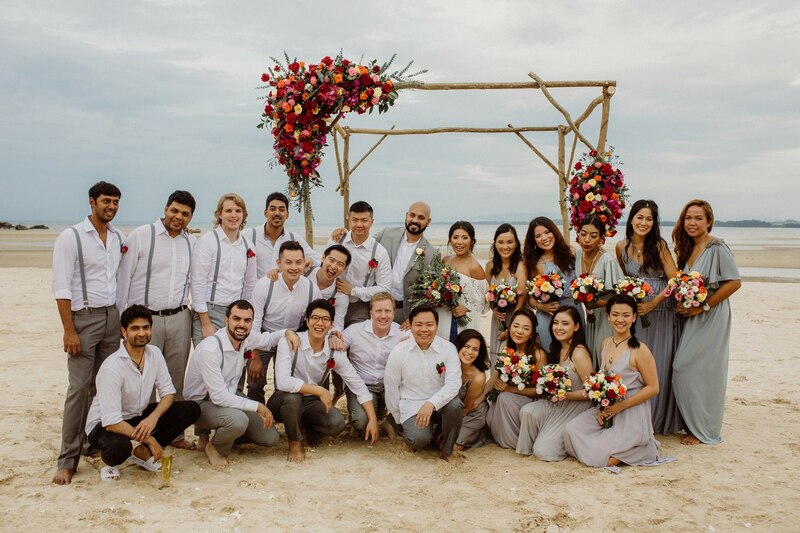 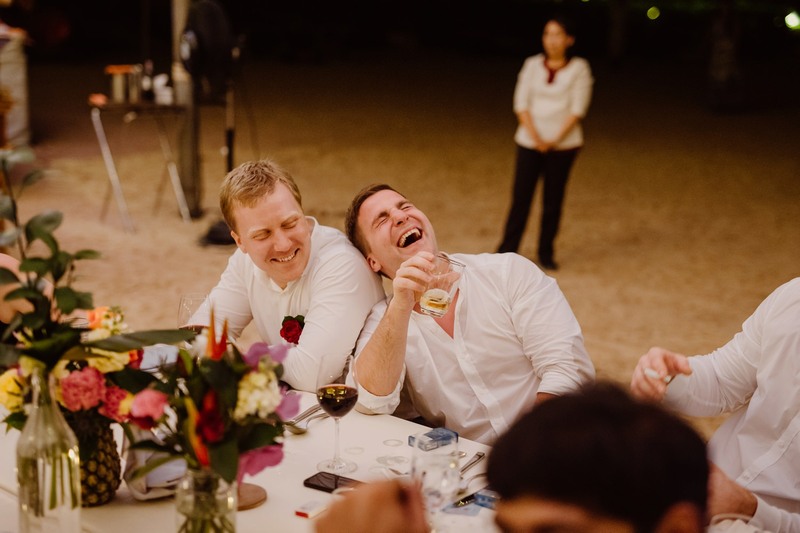 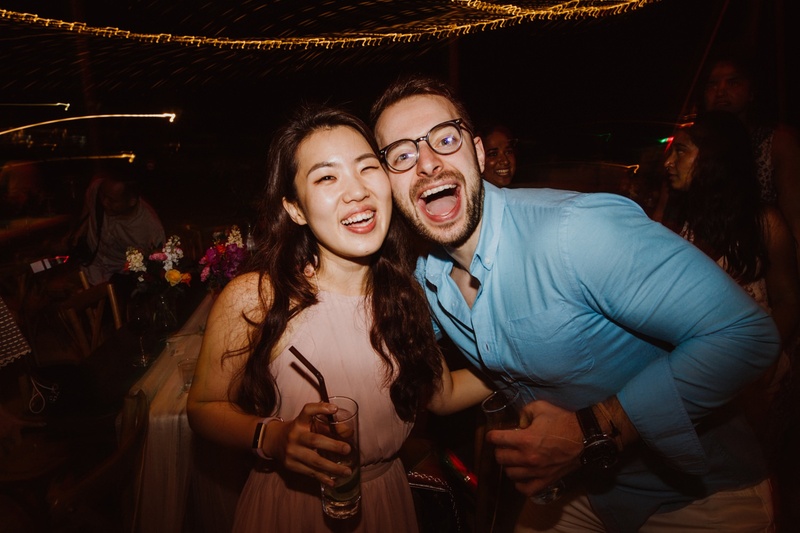 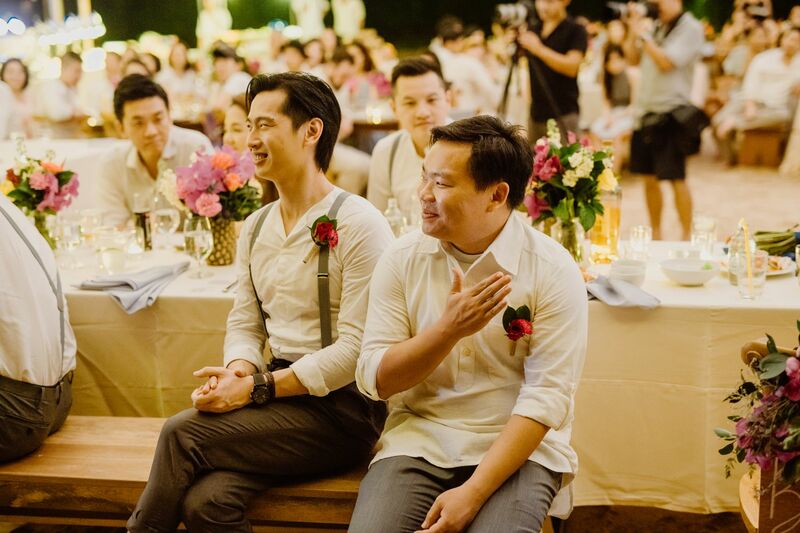 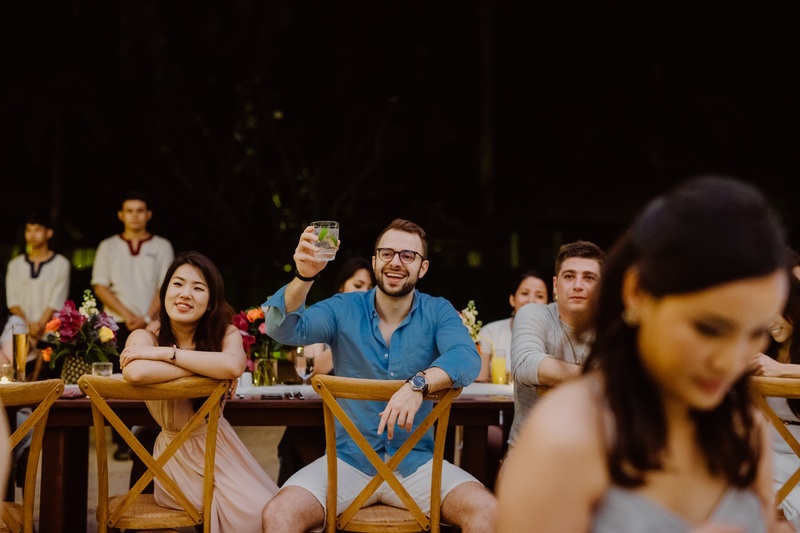 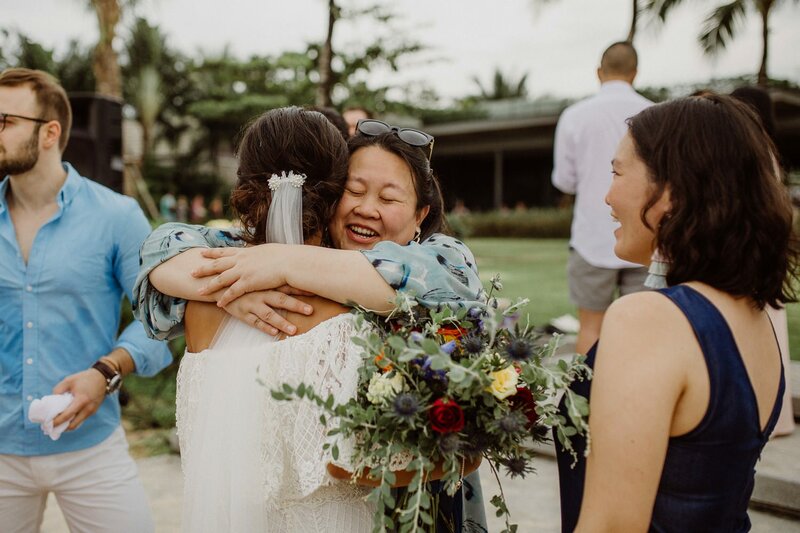 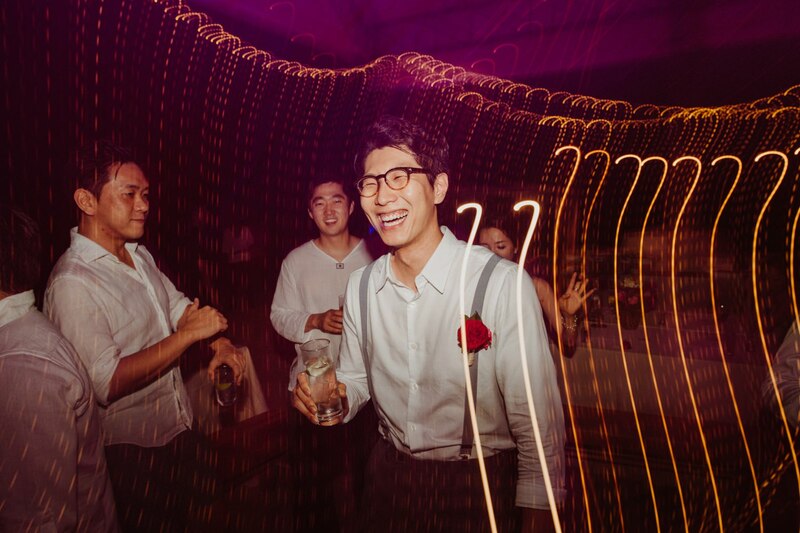 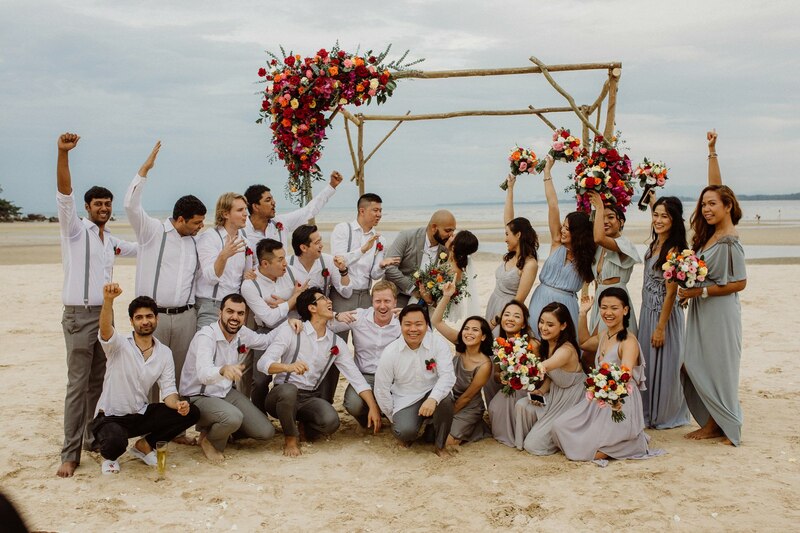 We made a connection and became friends so I was more than ecstatic to come to Thailand for their special day. 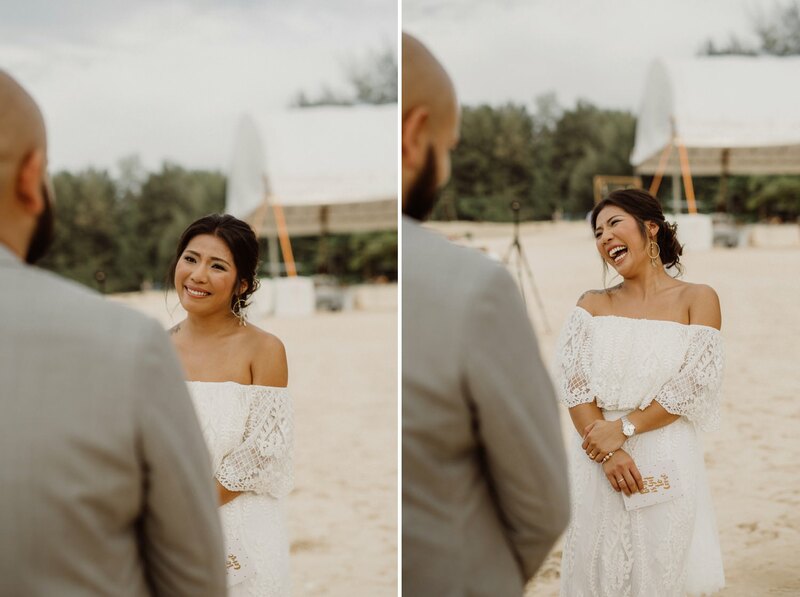 Just before the wedding we also took time to make some pre-wedding shots in Phuket and connected also through the camera. 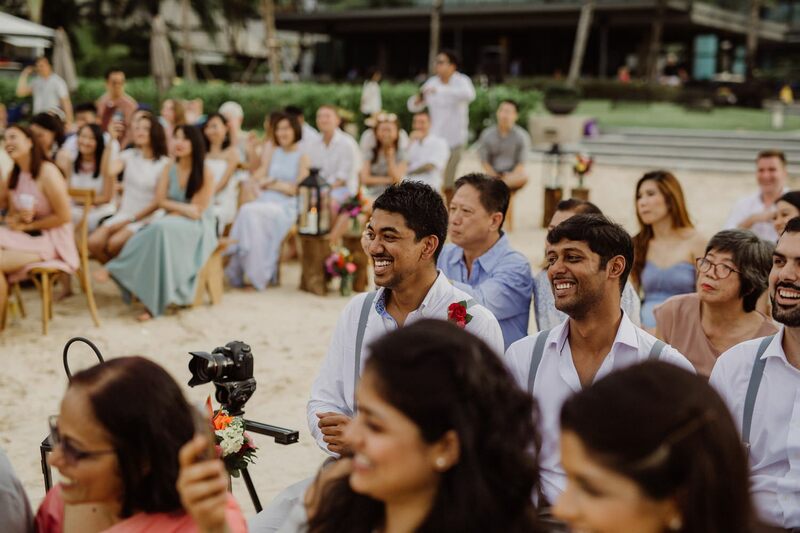 Tarn comes from Thailand and Sri is Indian, but they live together in Singapore. 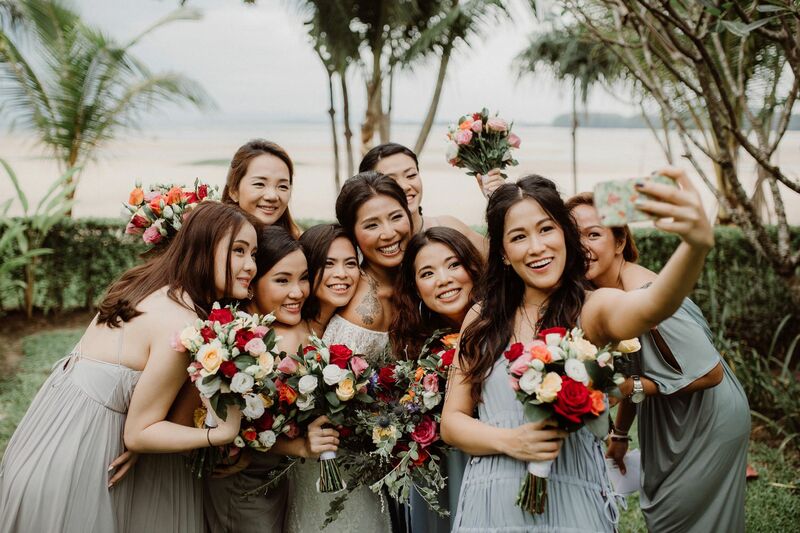 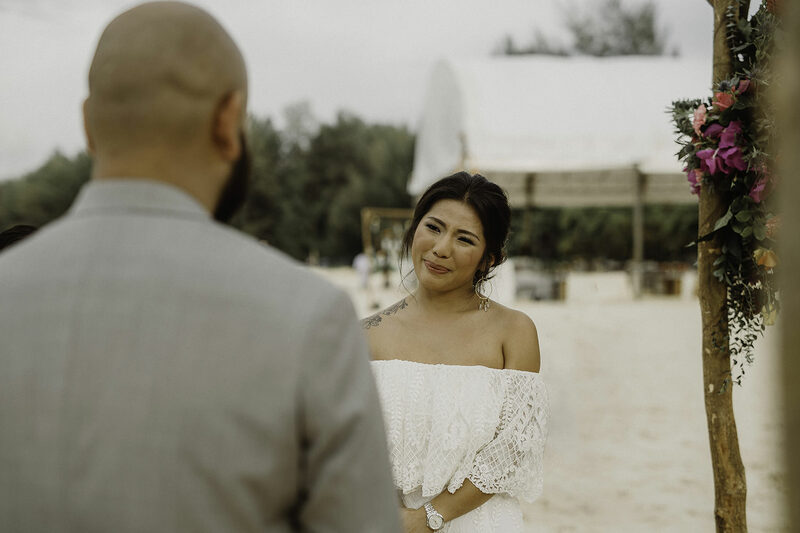 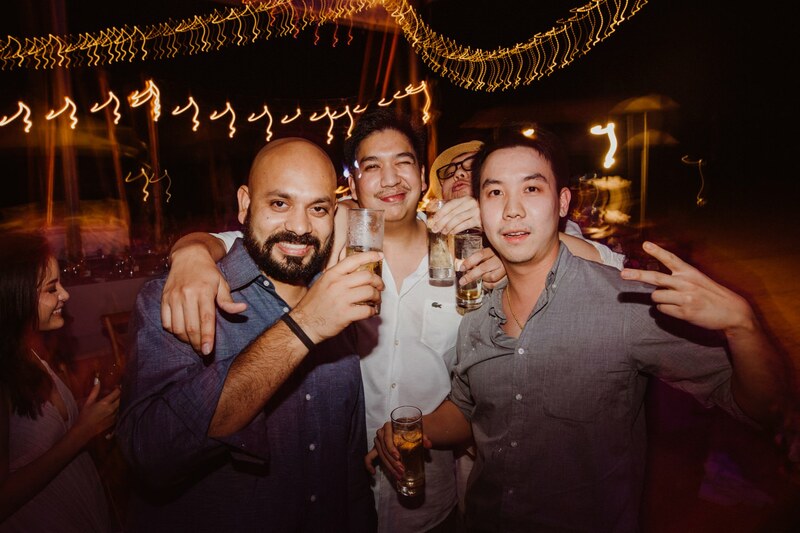 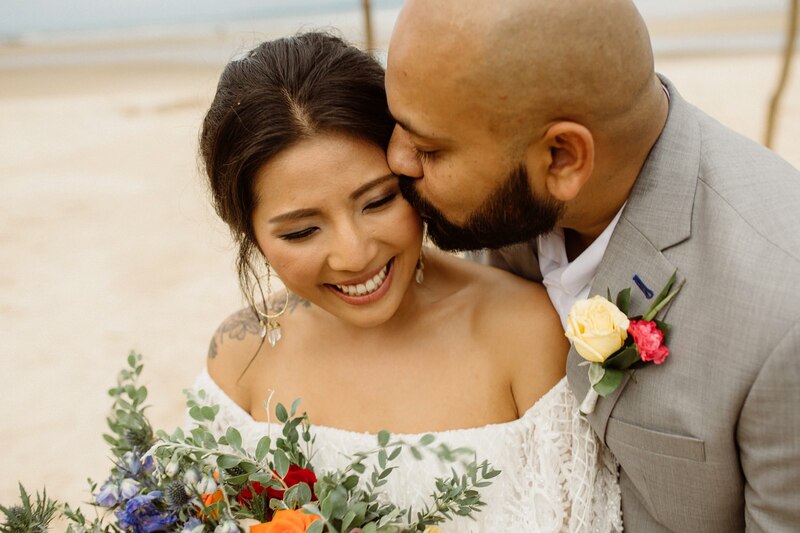 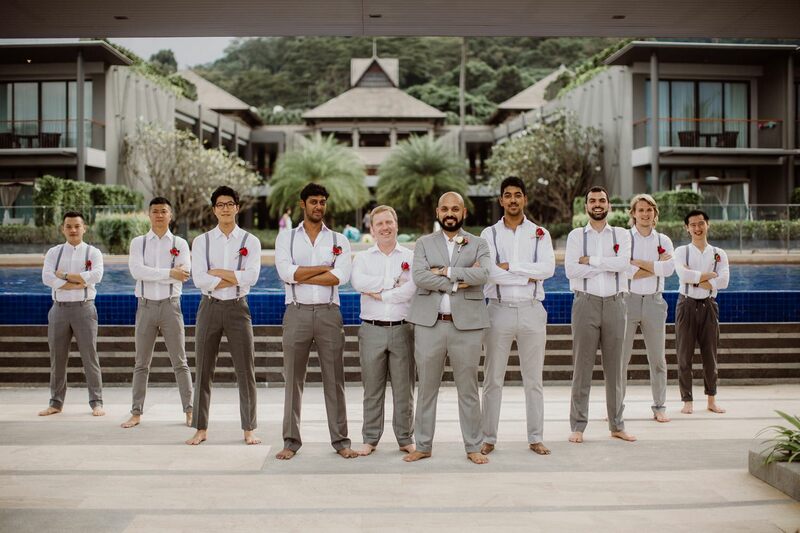 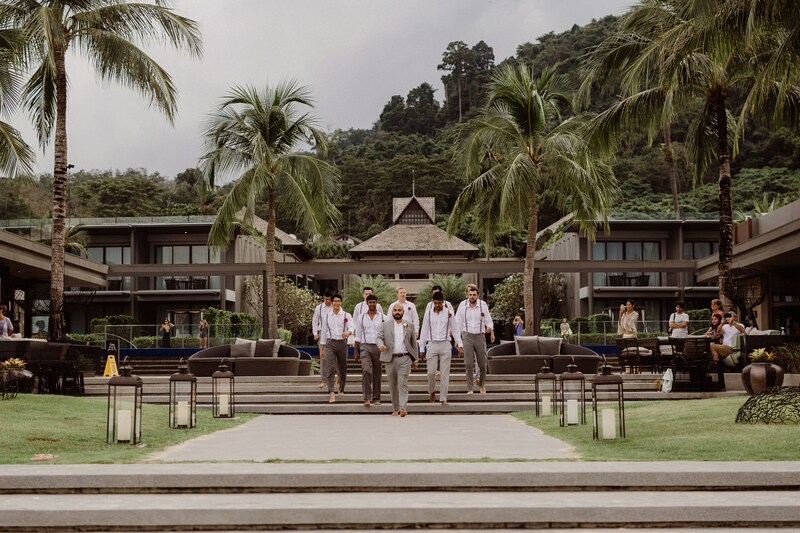 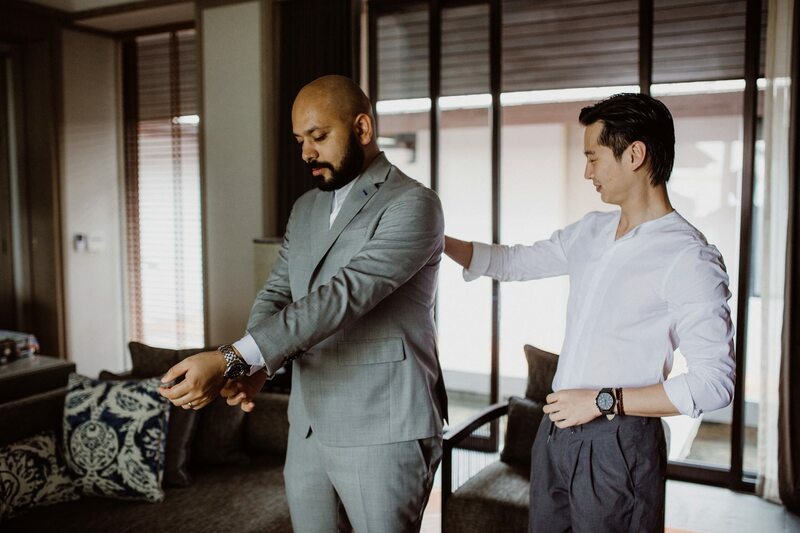 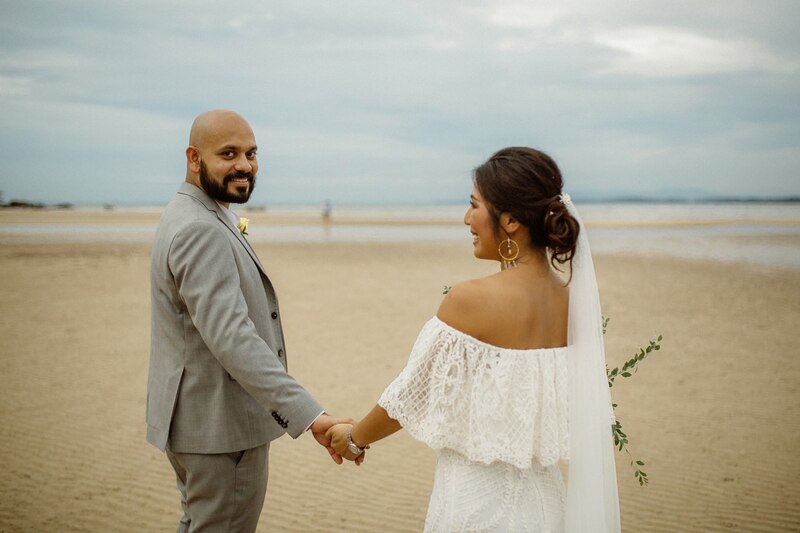 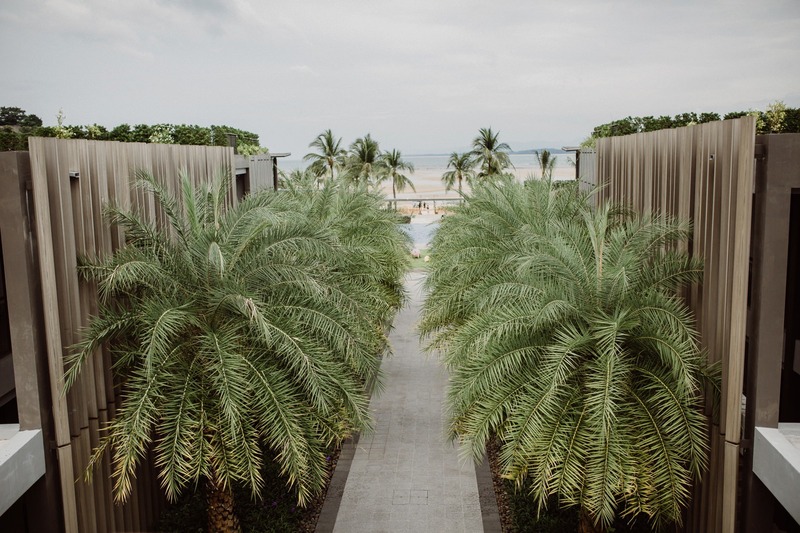 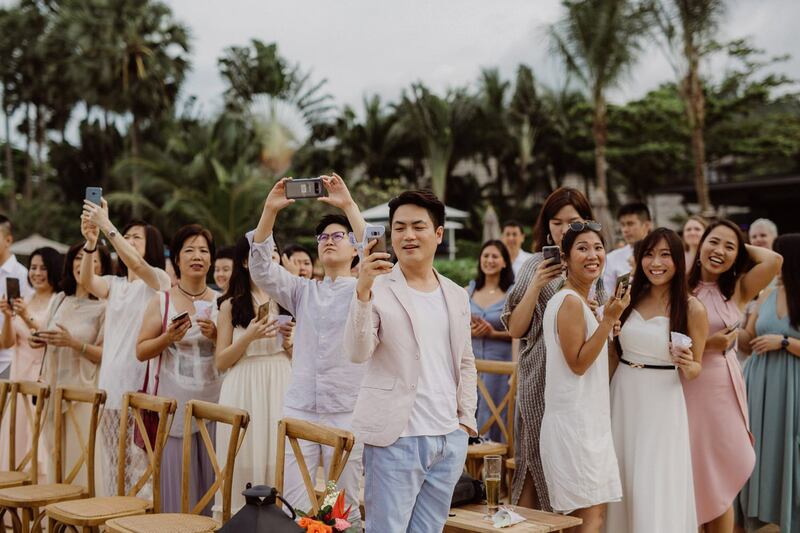 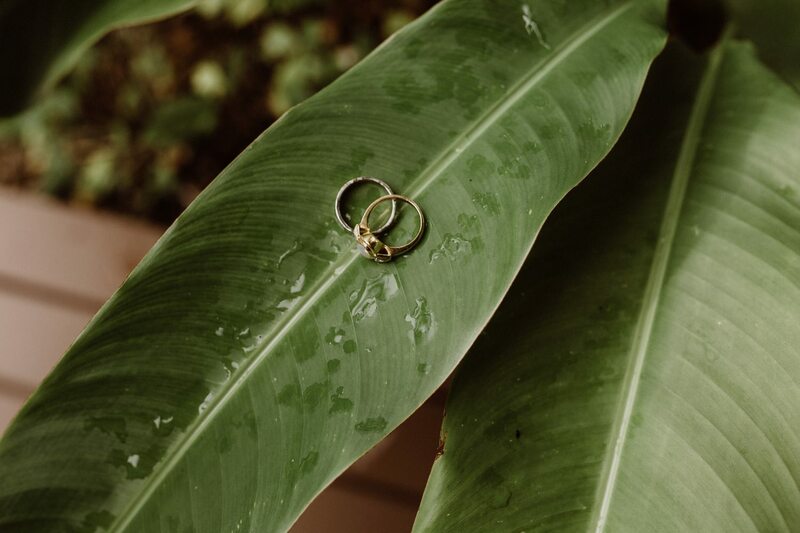 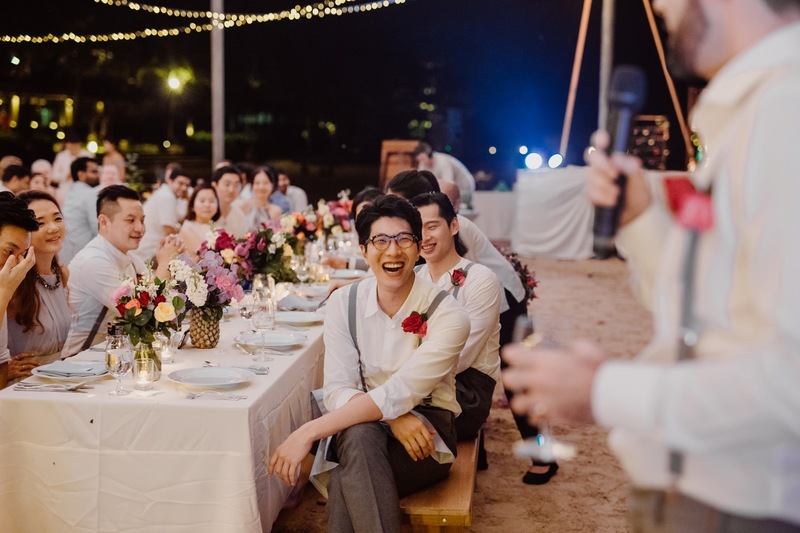 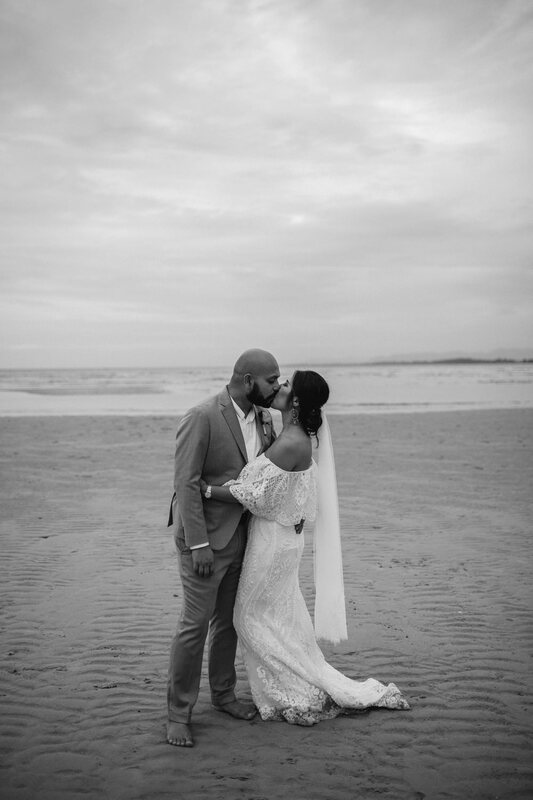 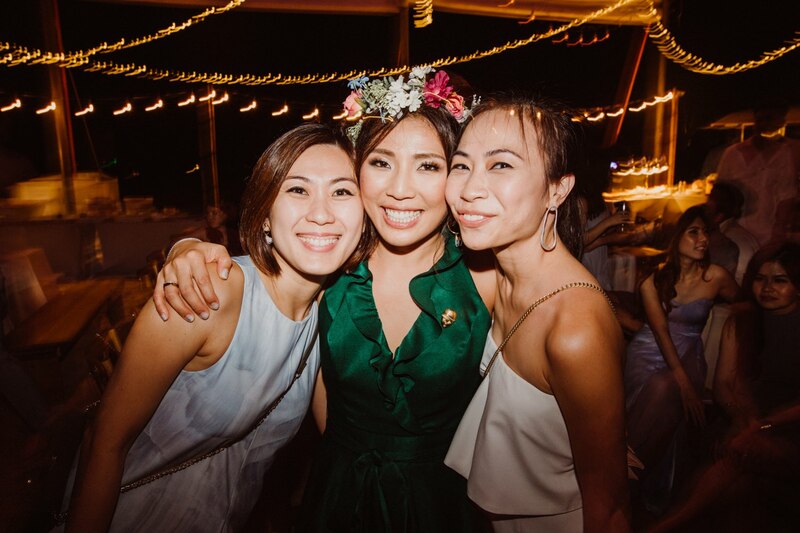 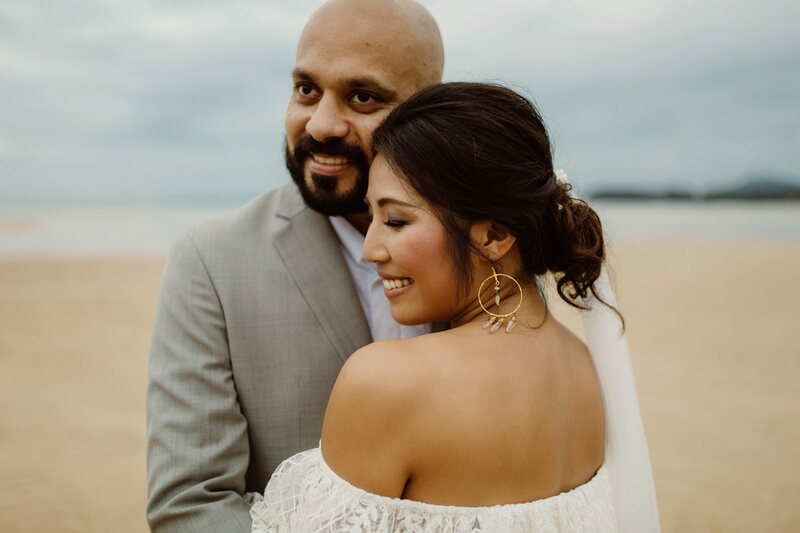 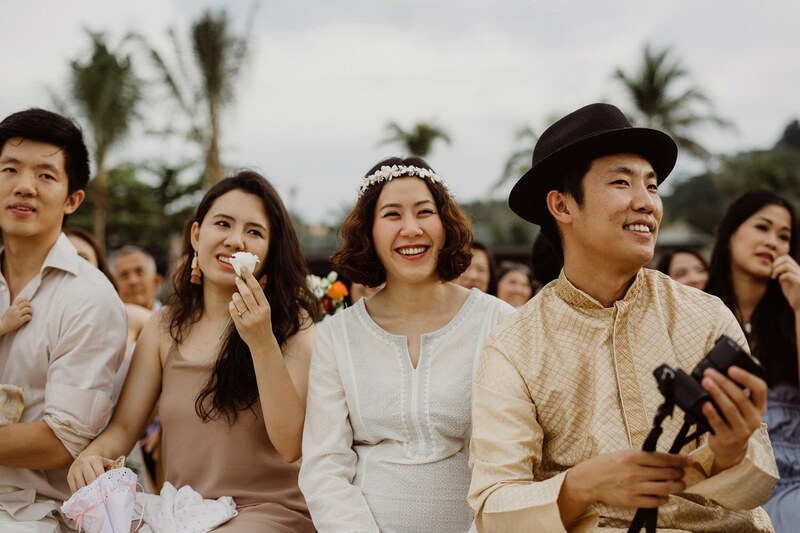 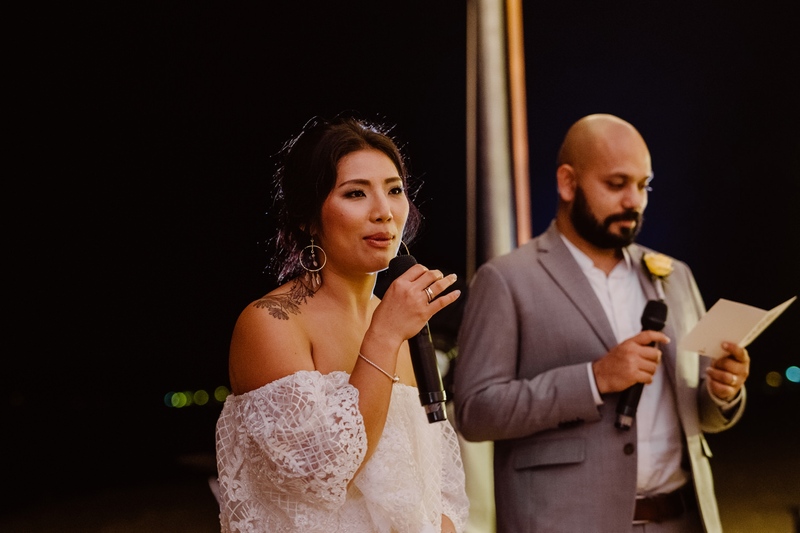 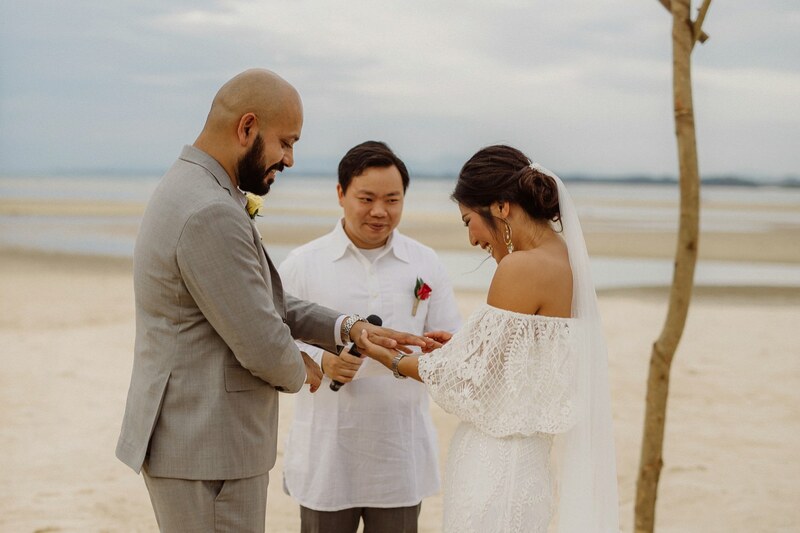 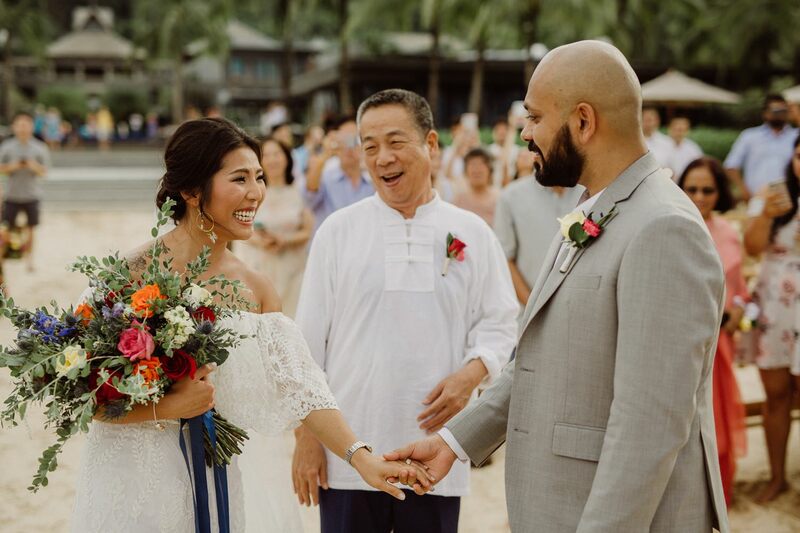 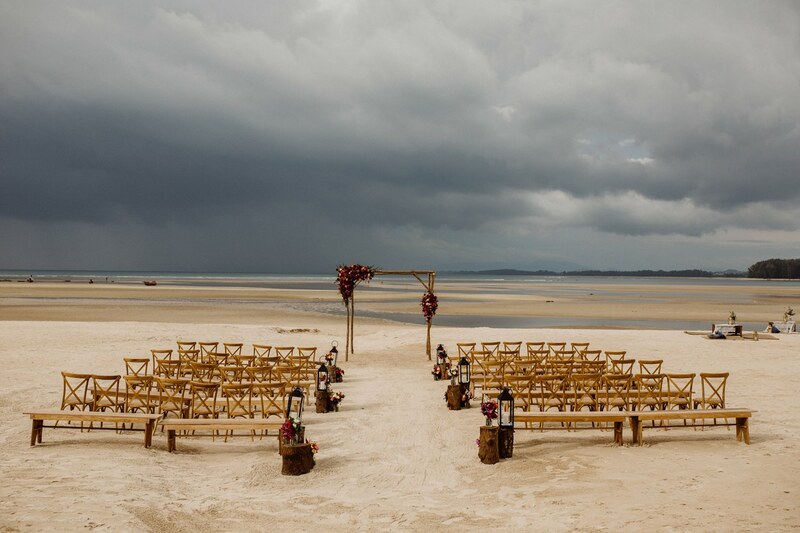 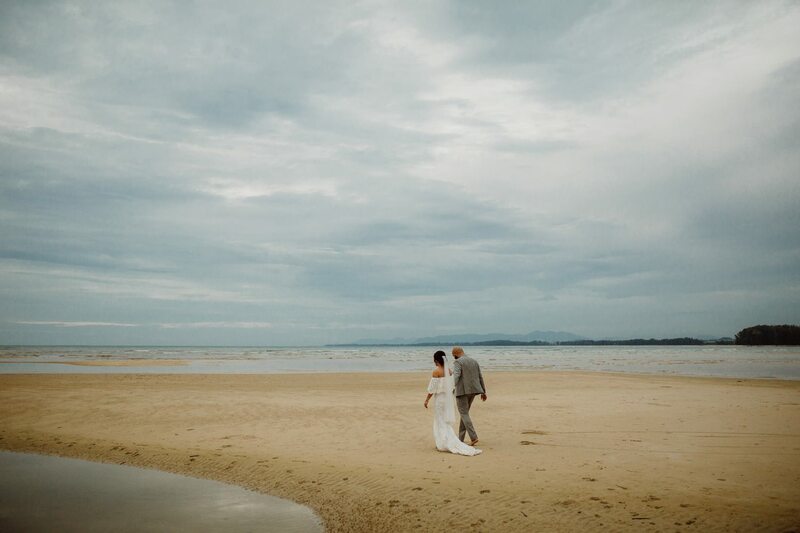 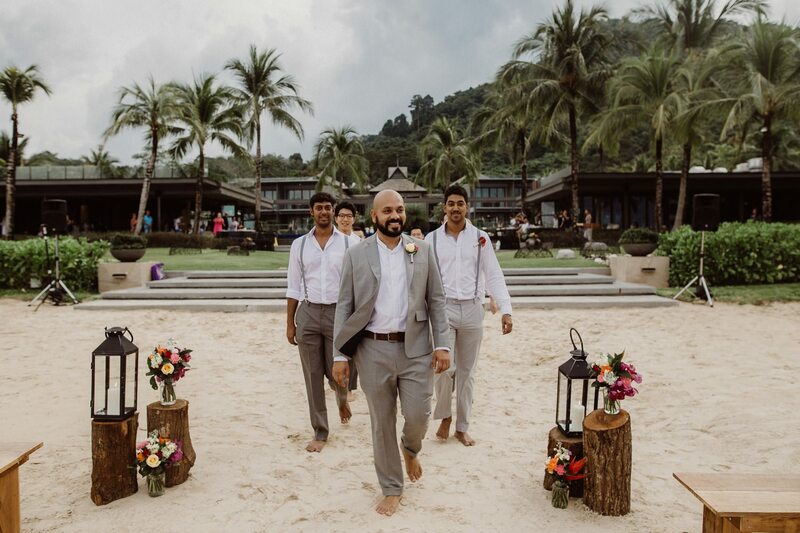 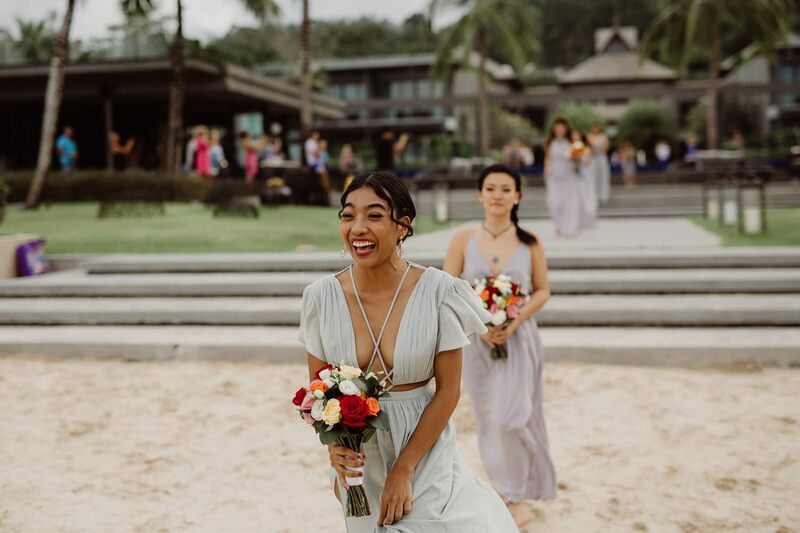 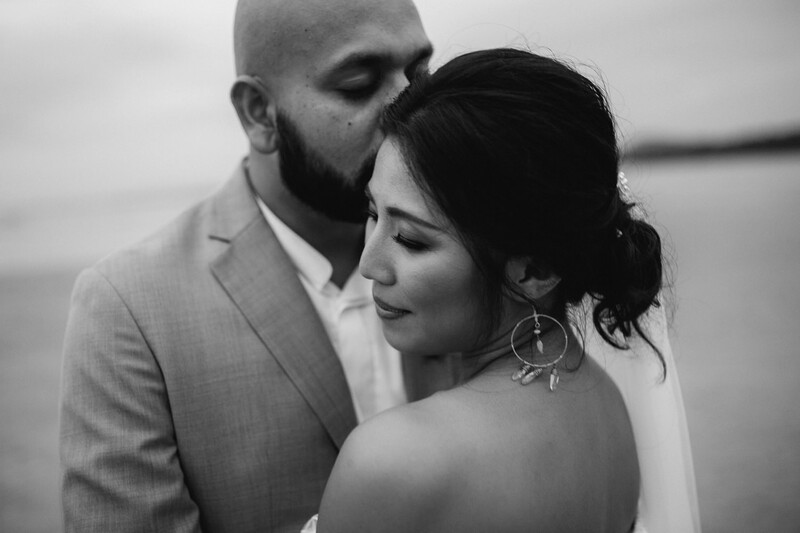 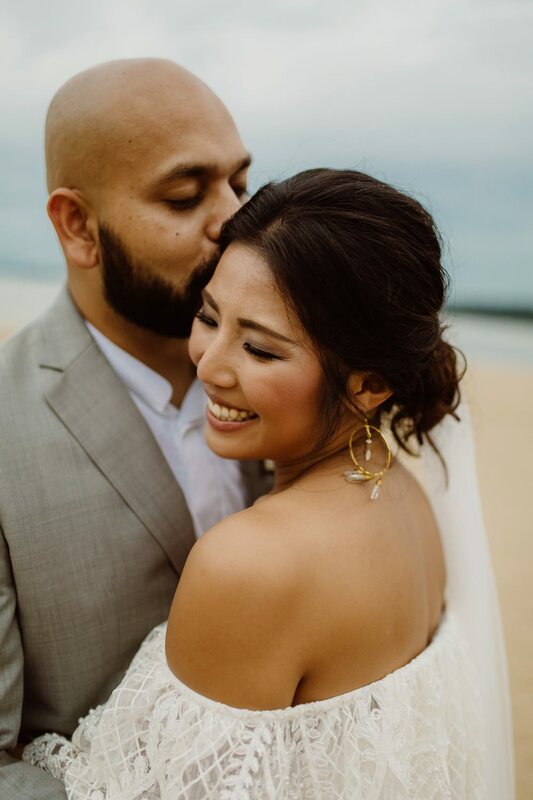 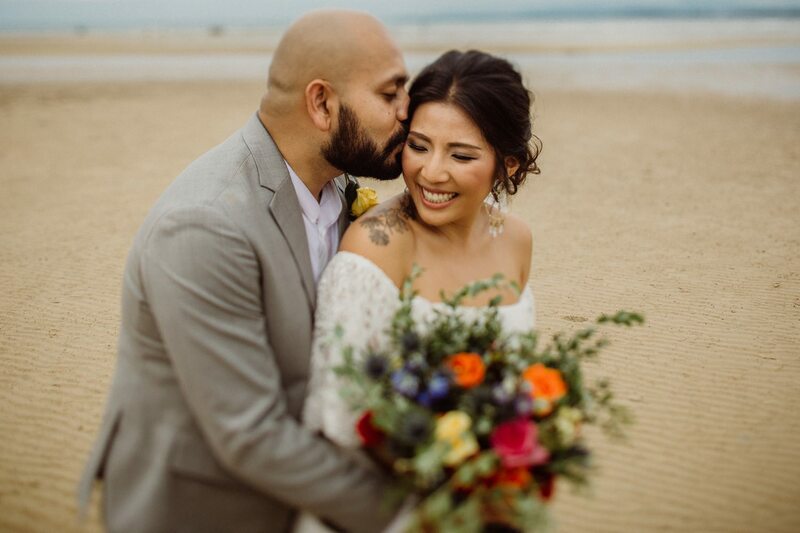 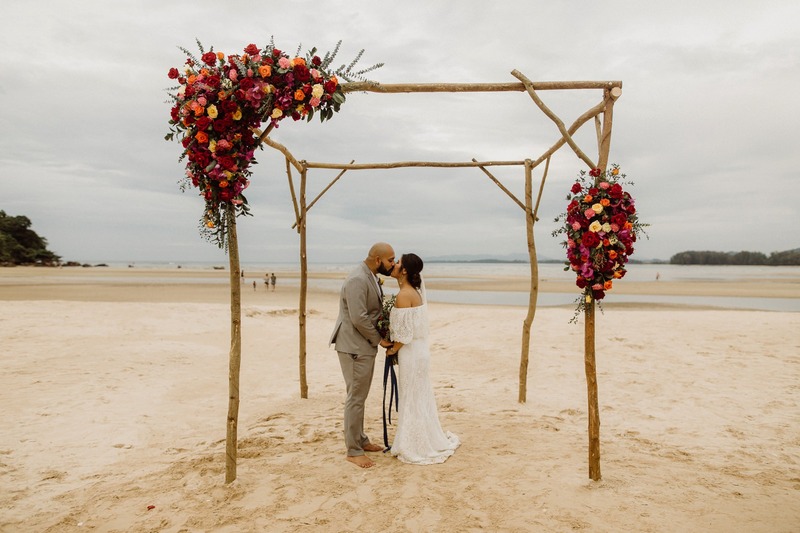 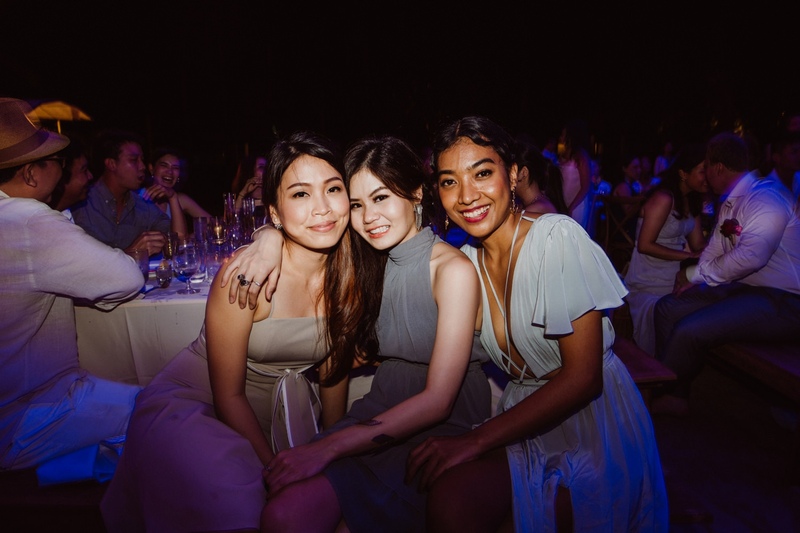 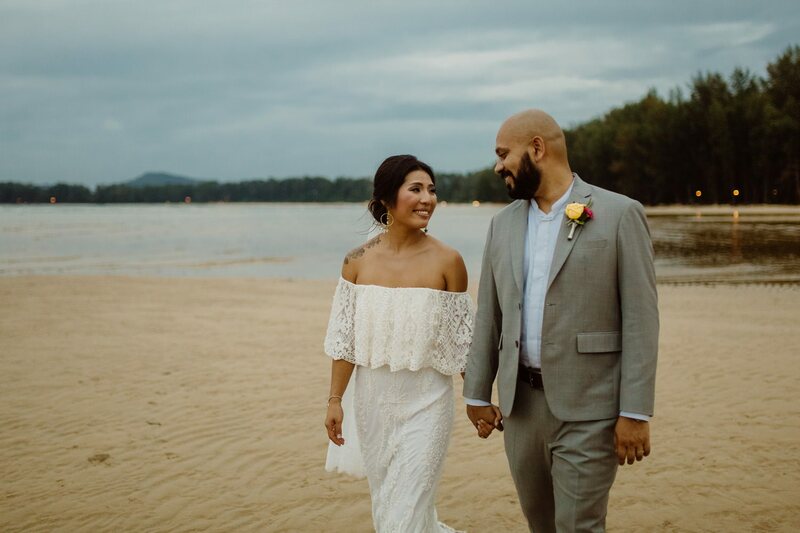 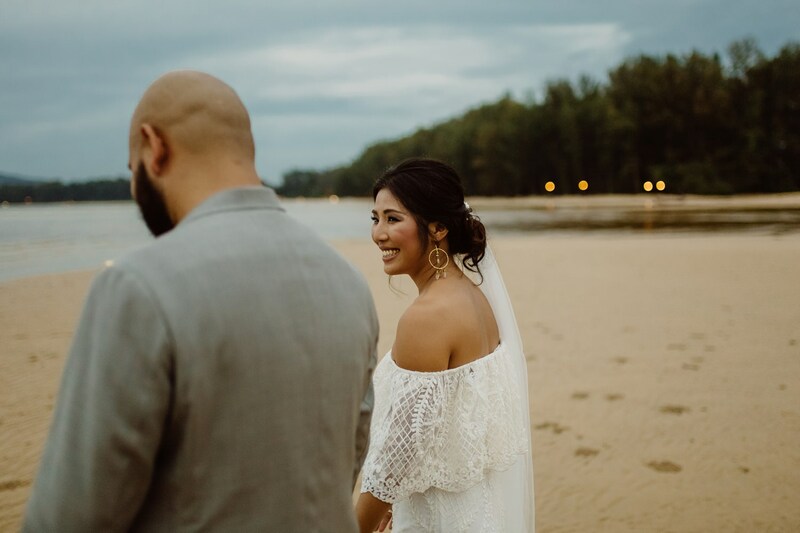 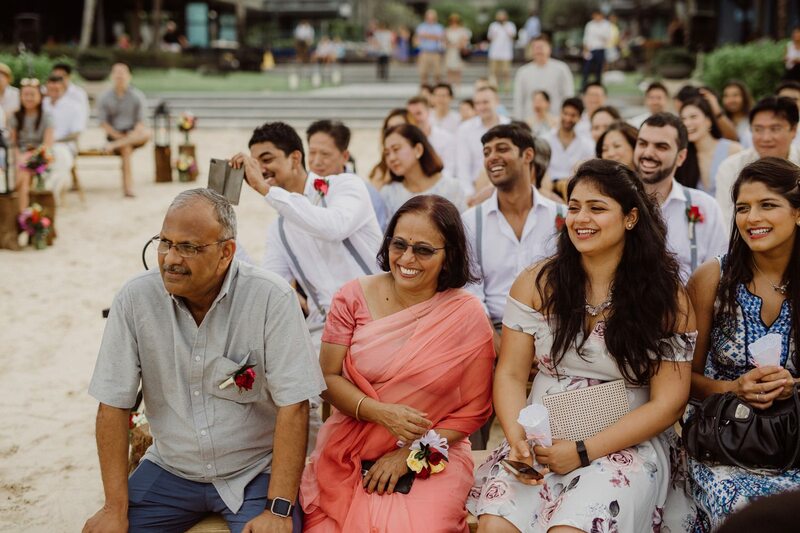 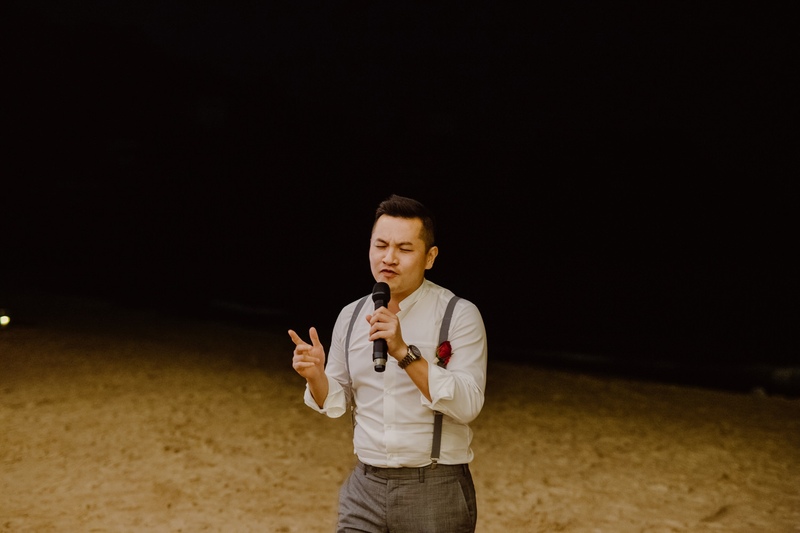 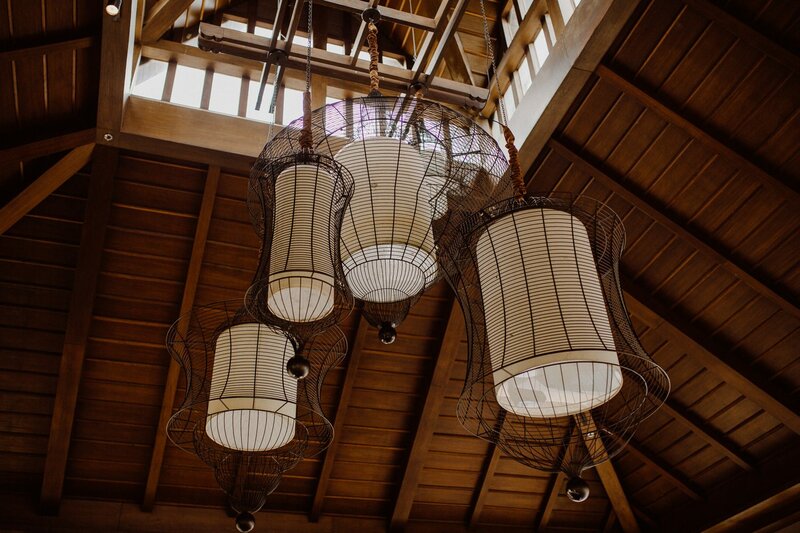 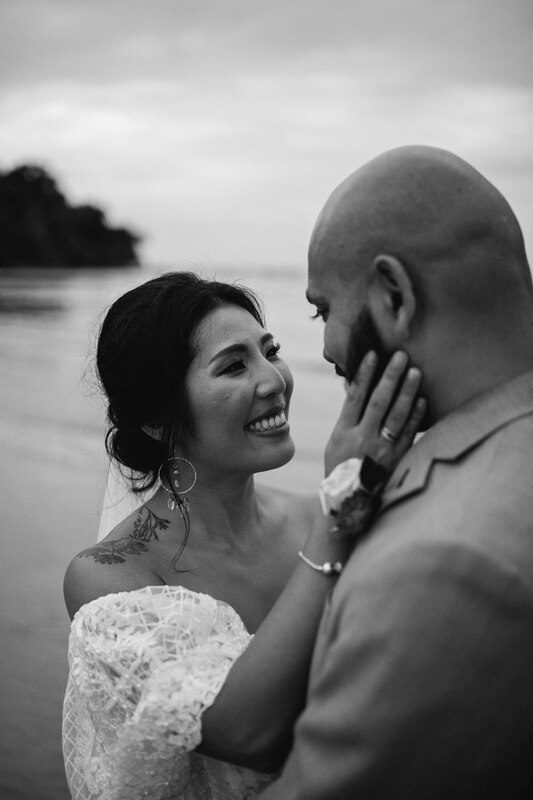 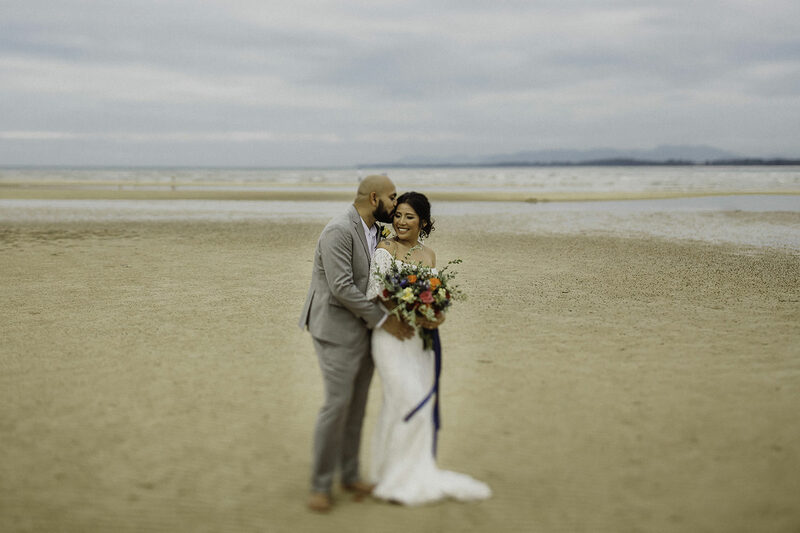 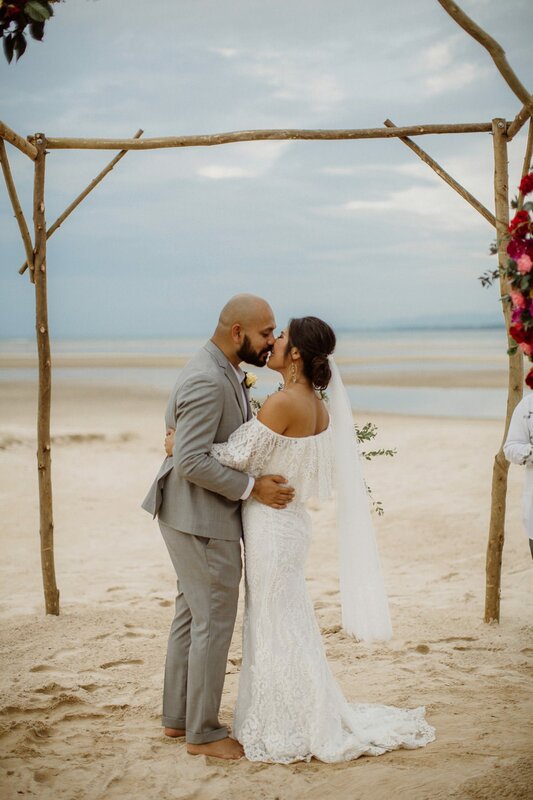 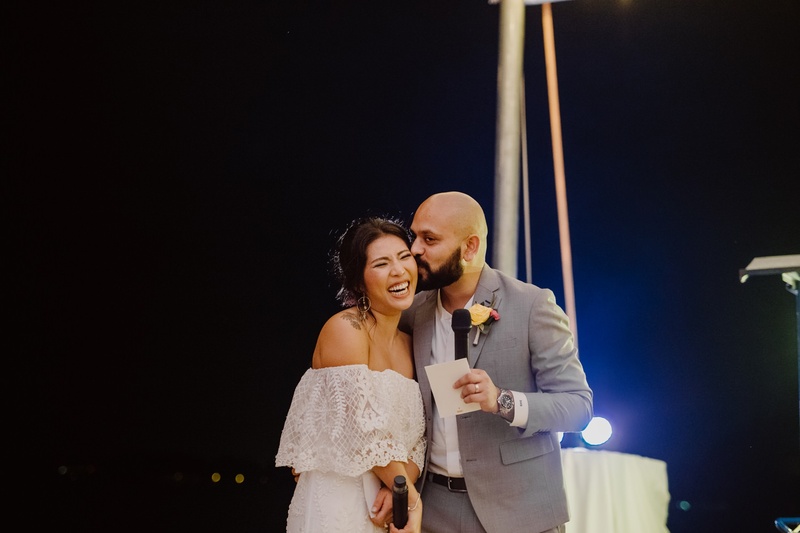 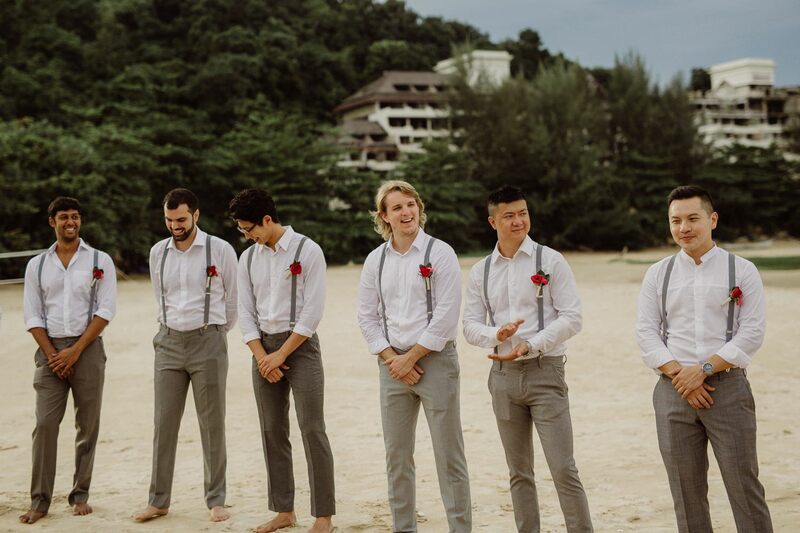 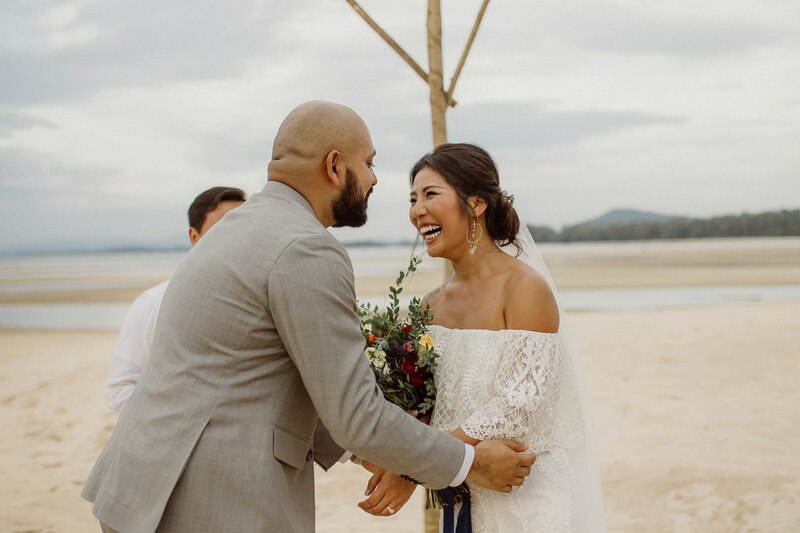 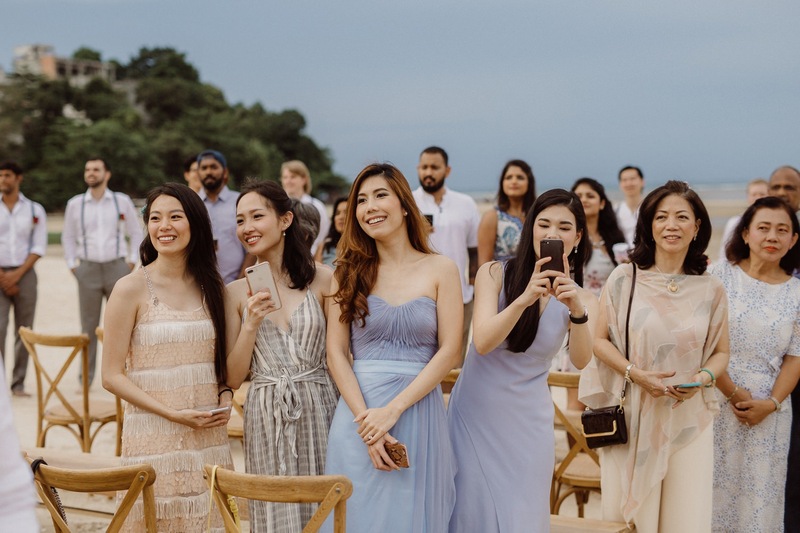 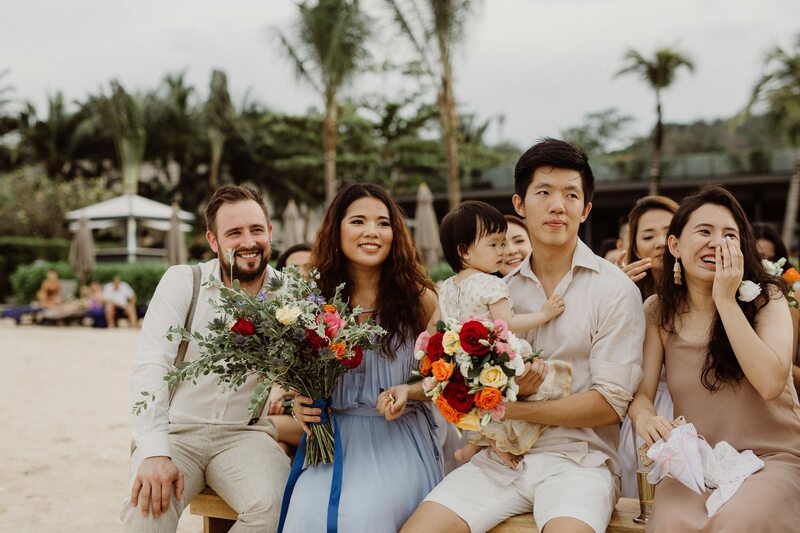 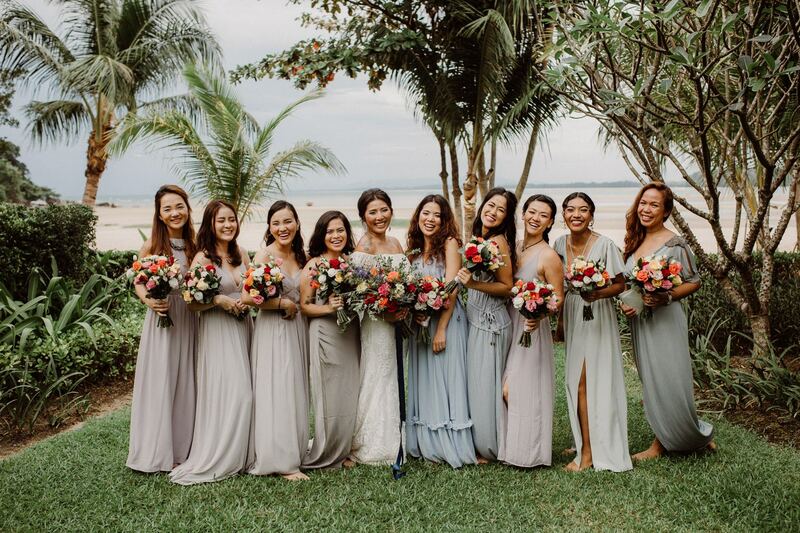 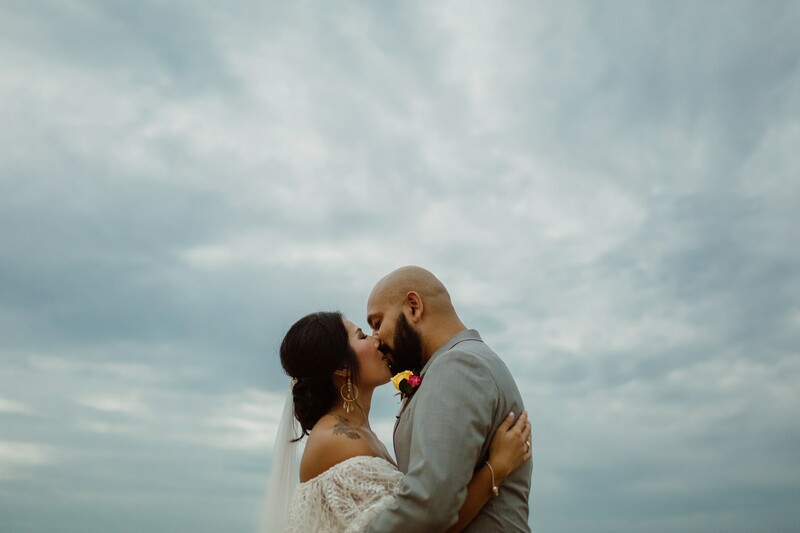 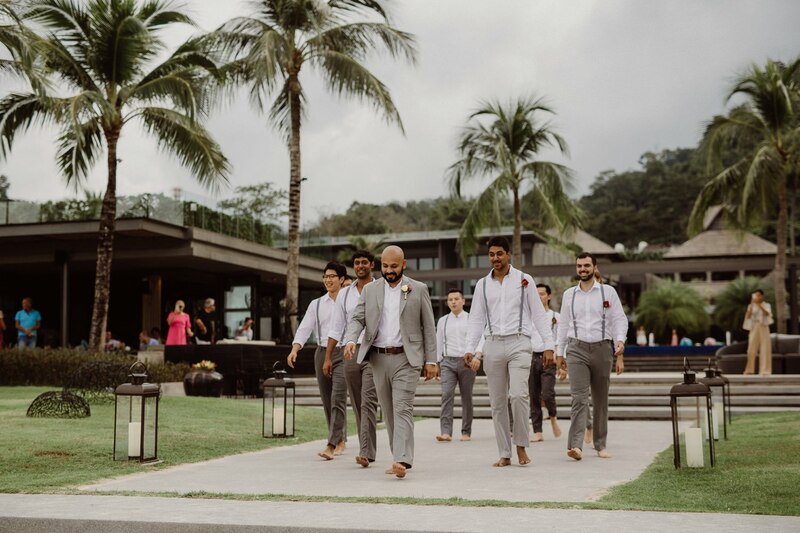 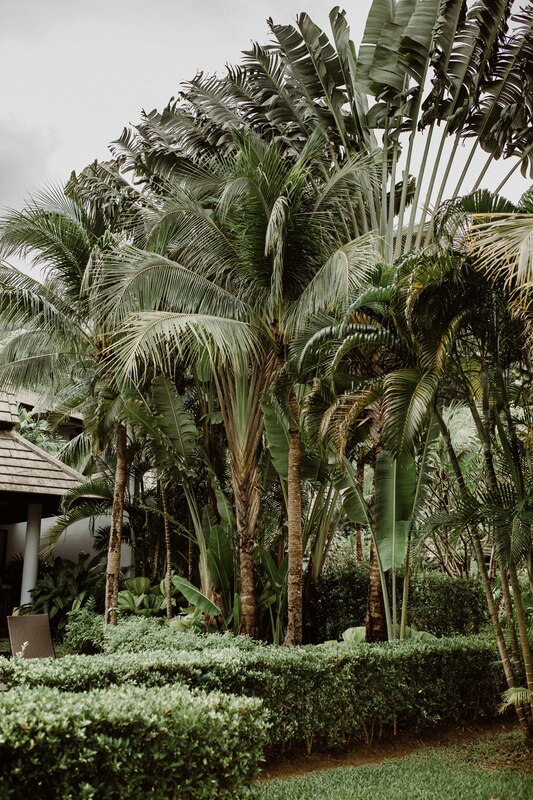 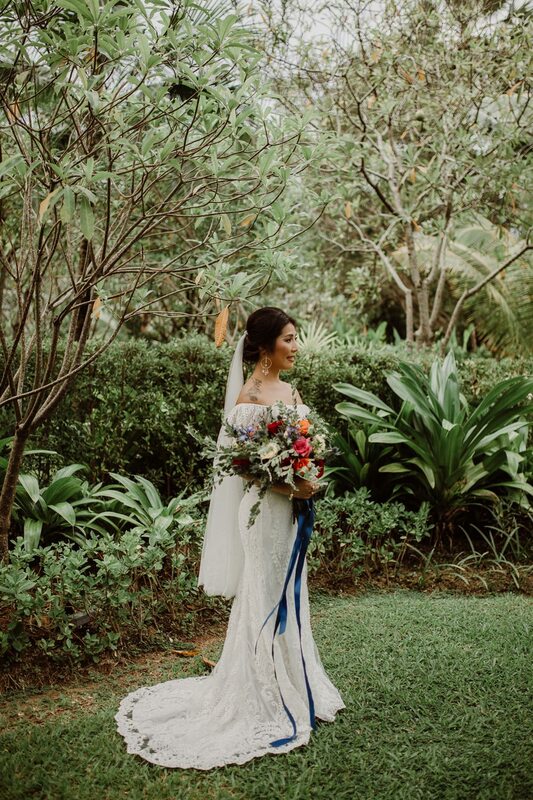 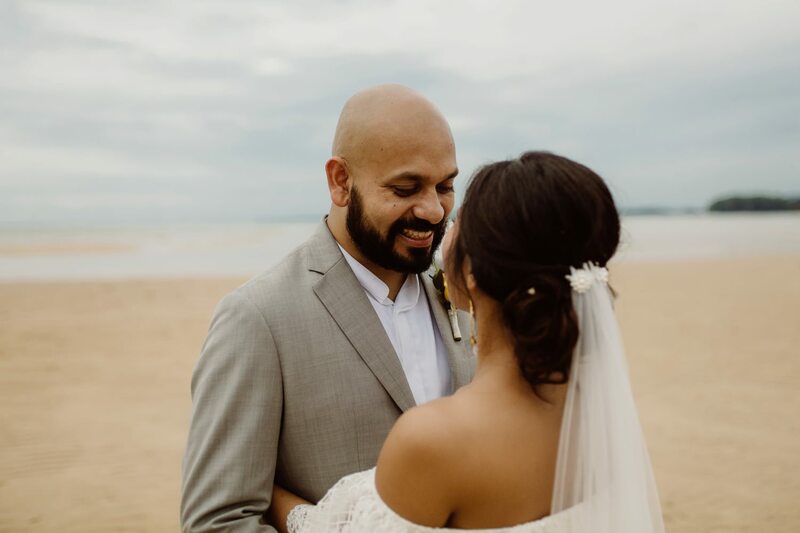 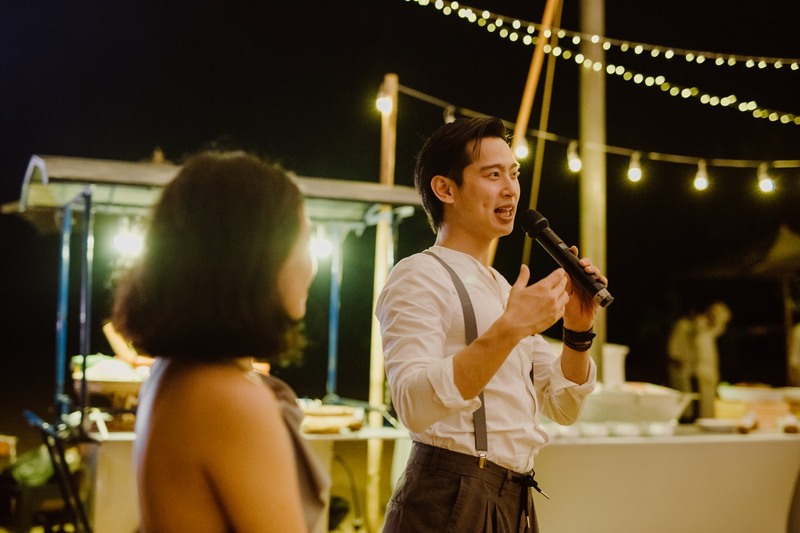 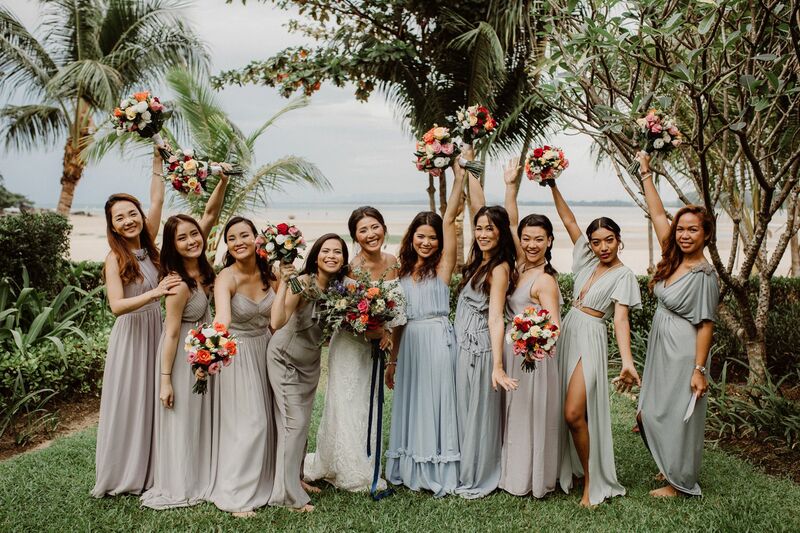 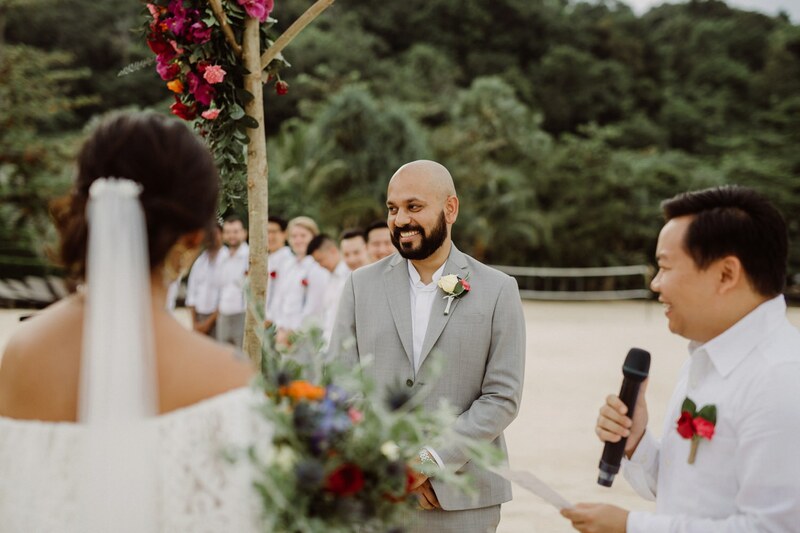 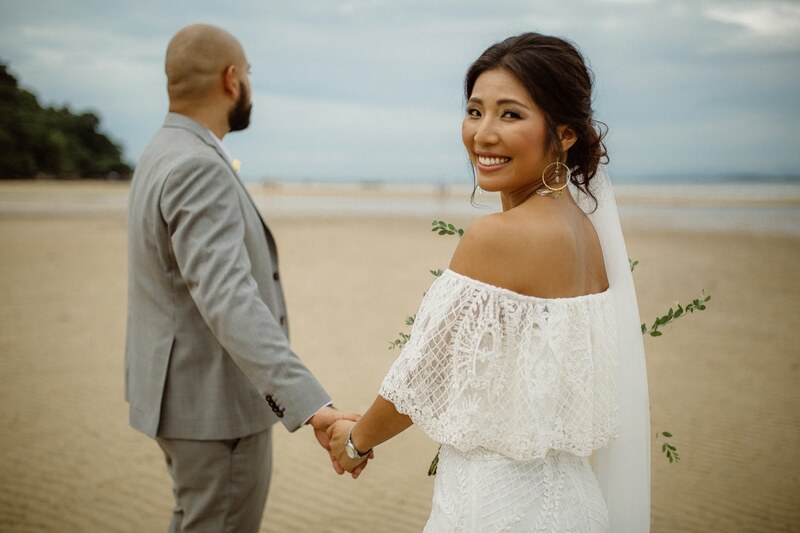 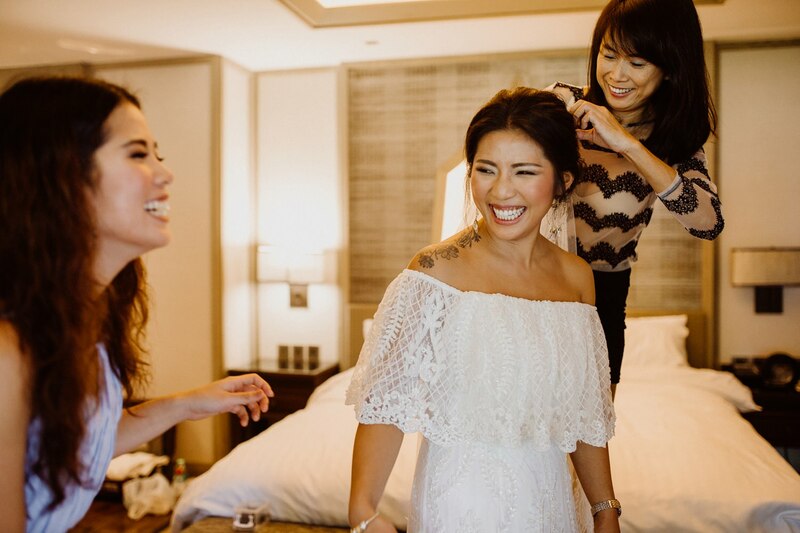 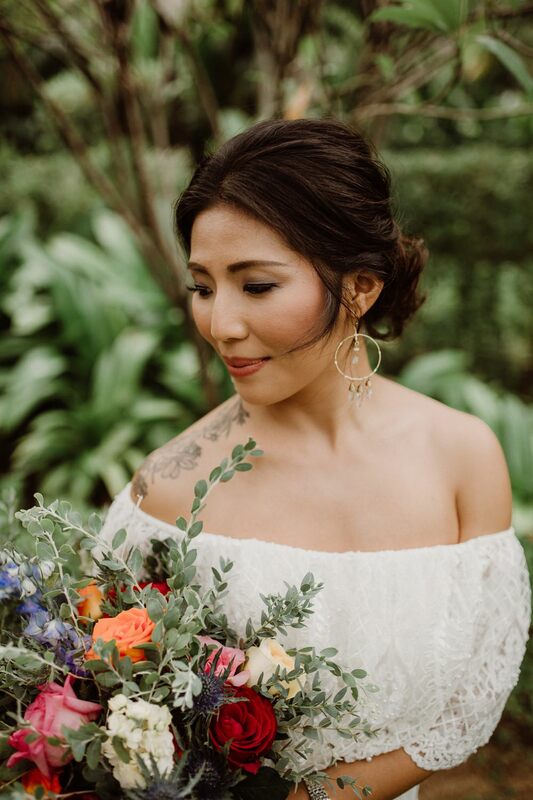 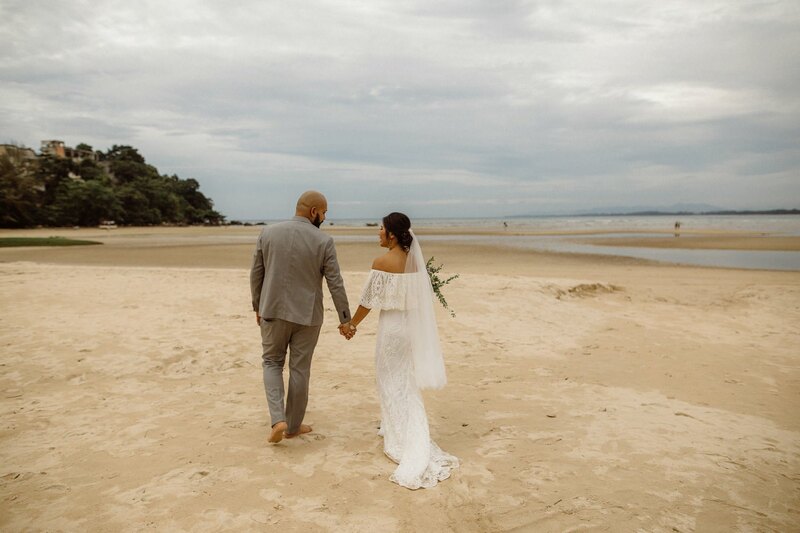 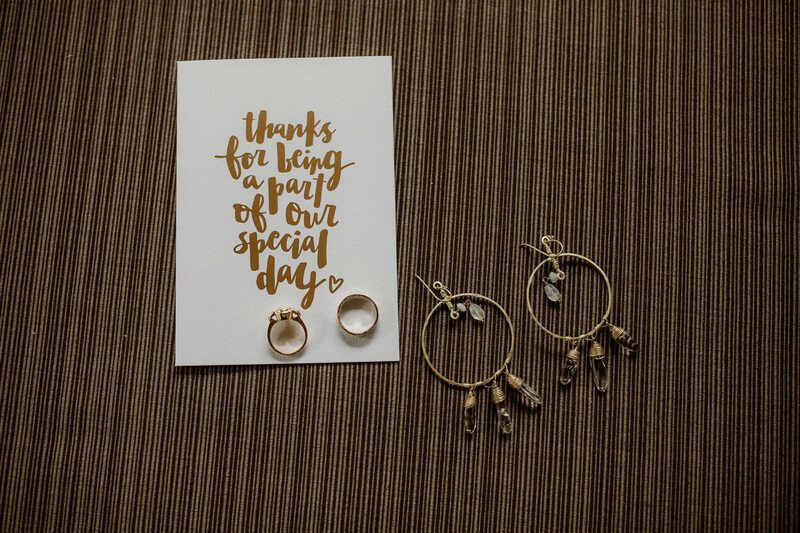 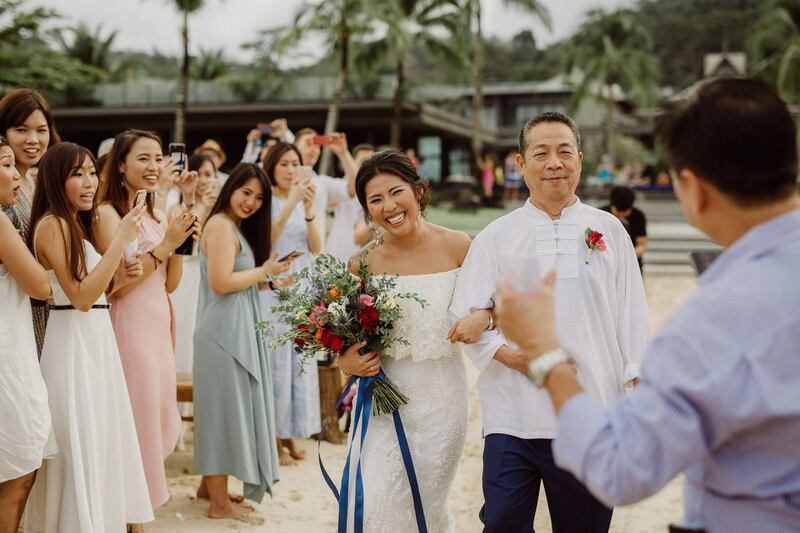 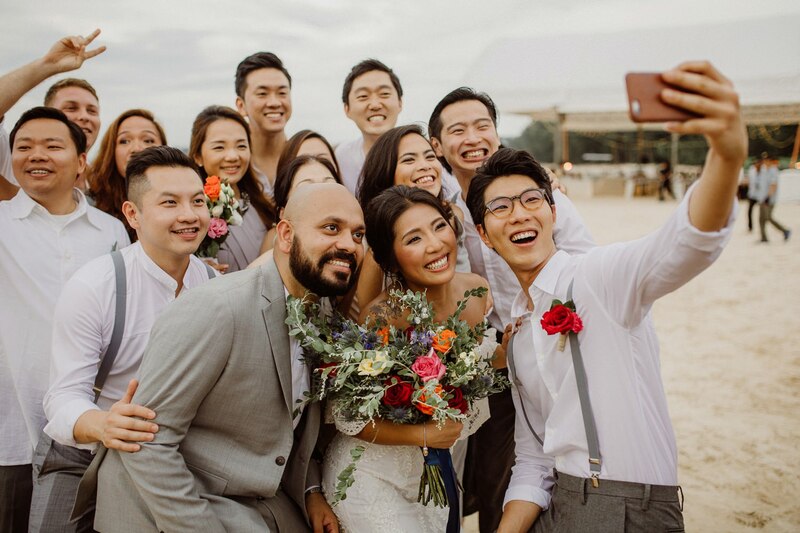 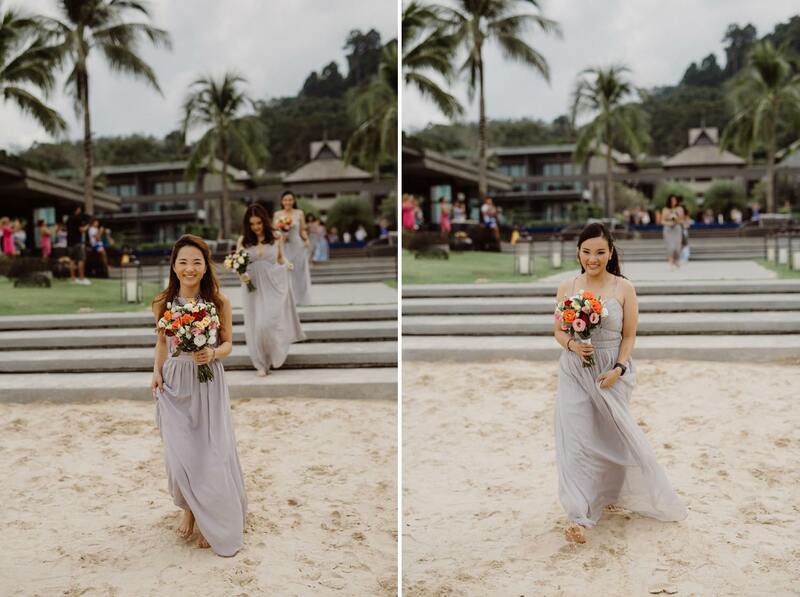 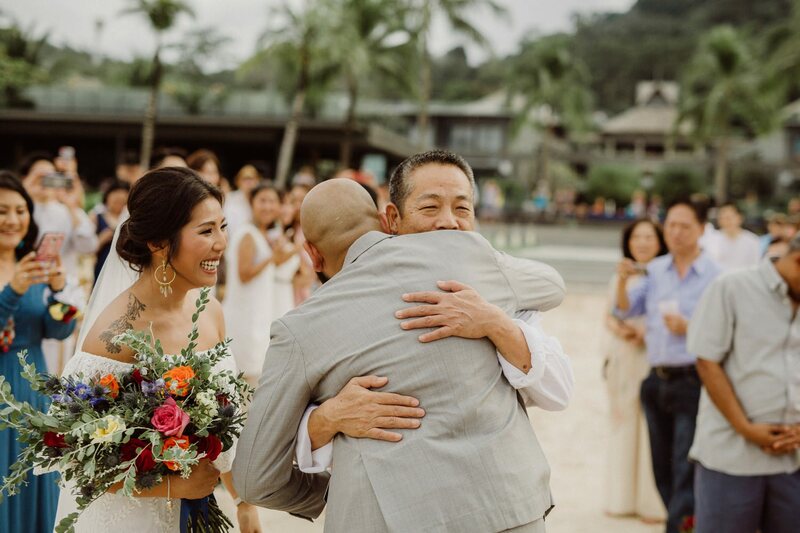 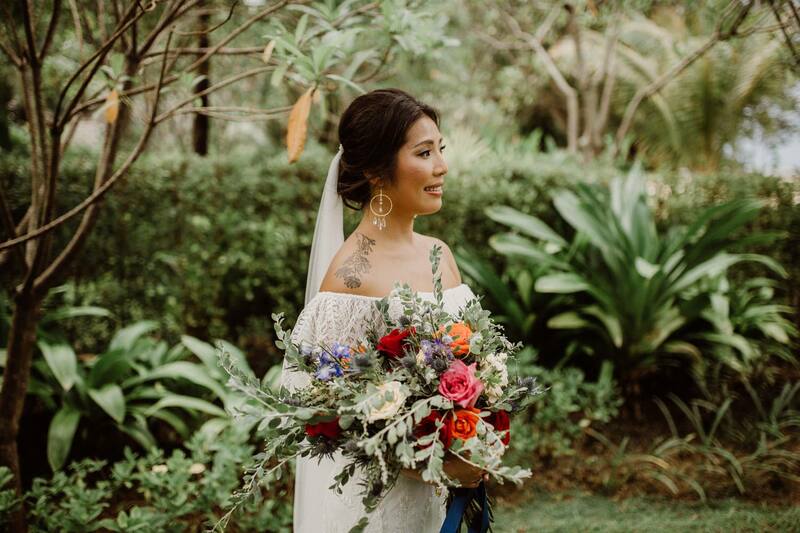 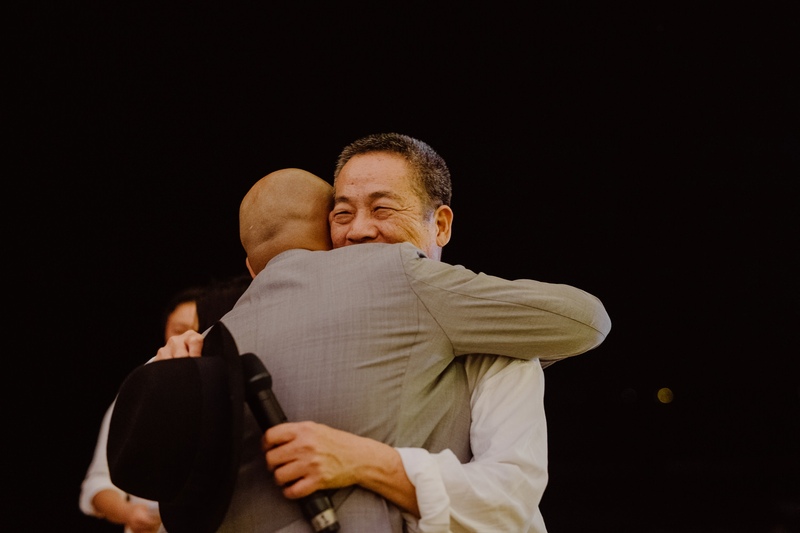 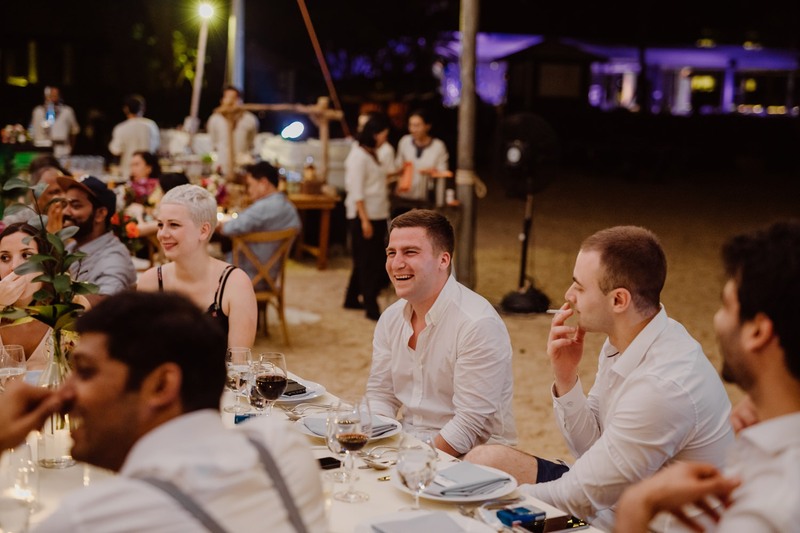 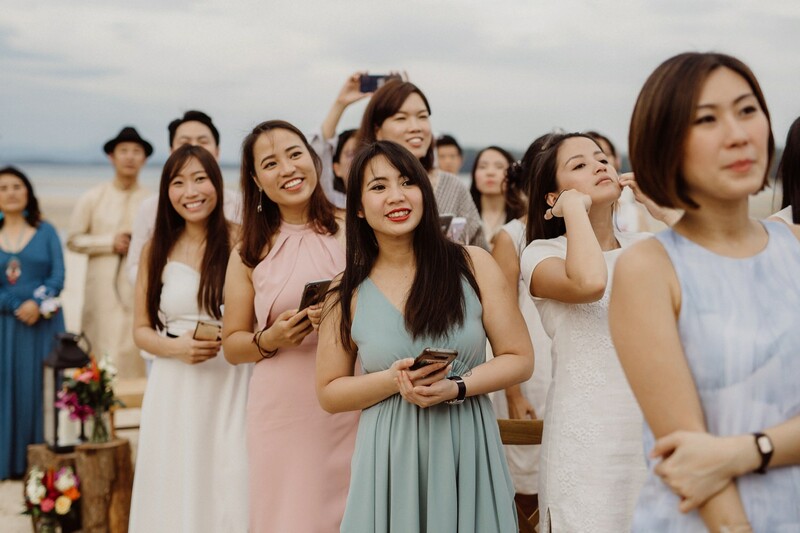 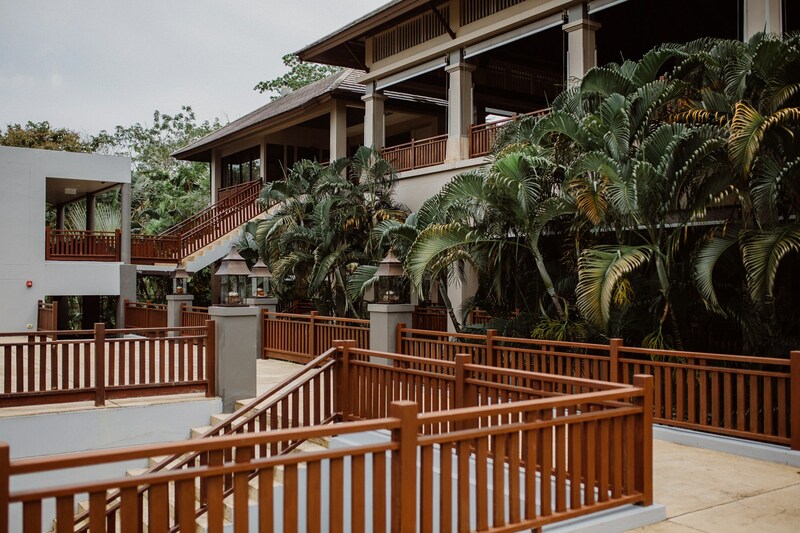 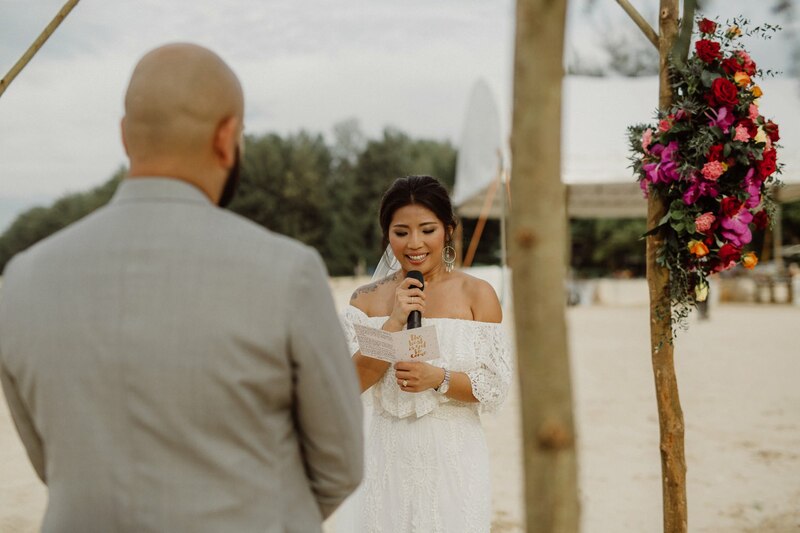 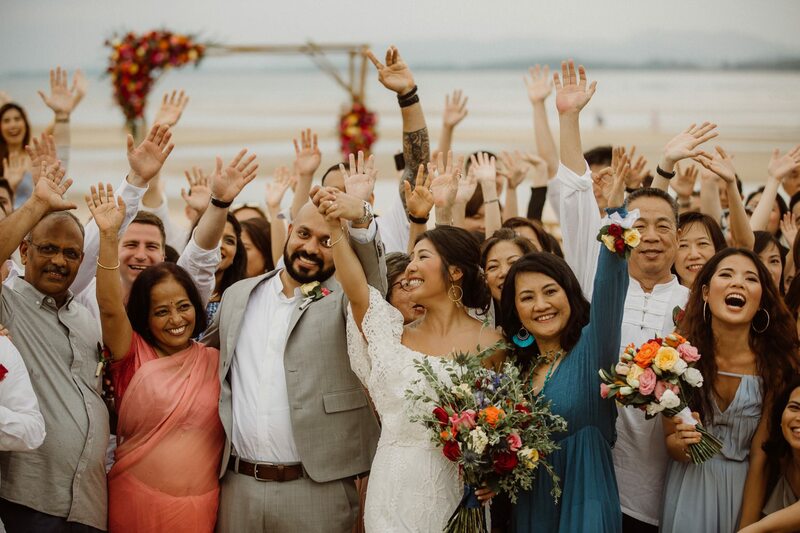 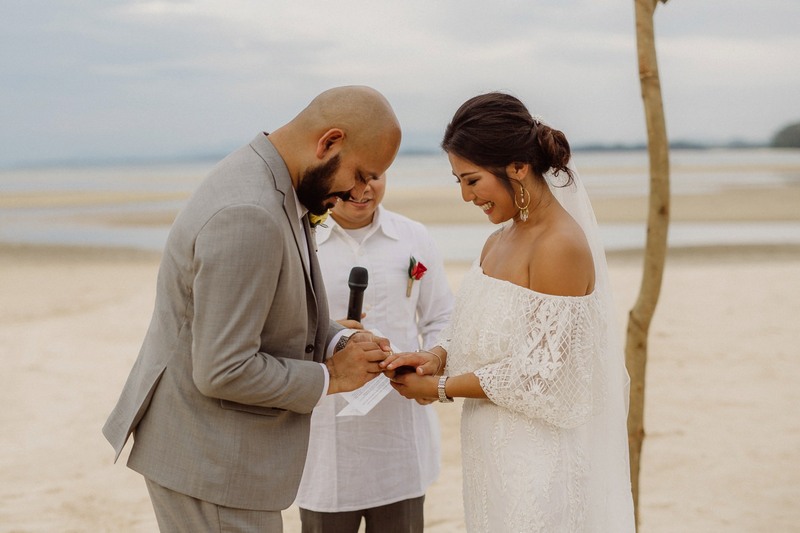 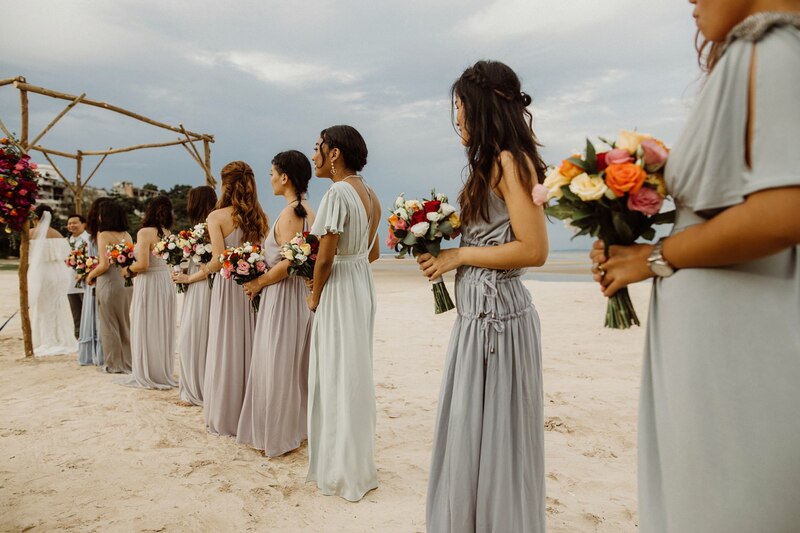 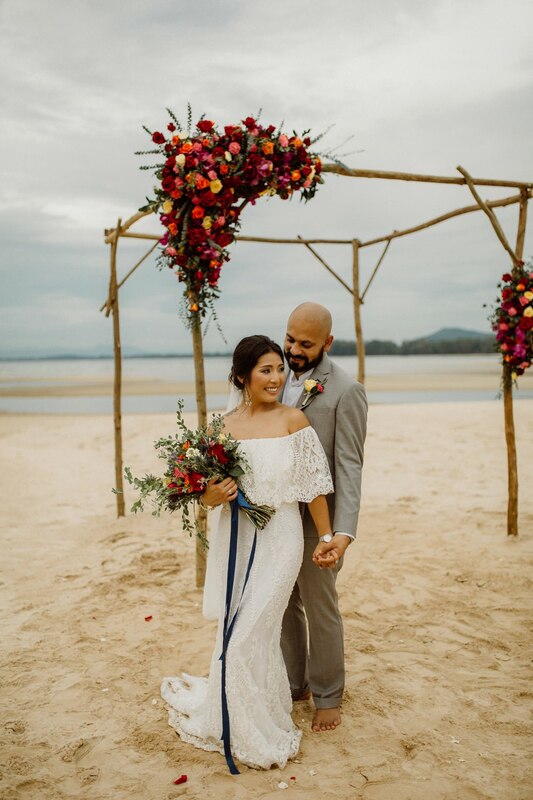 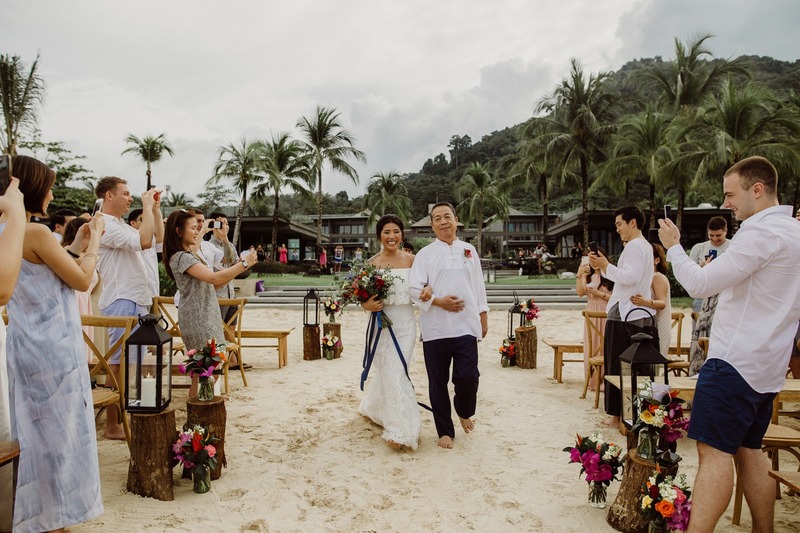 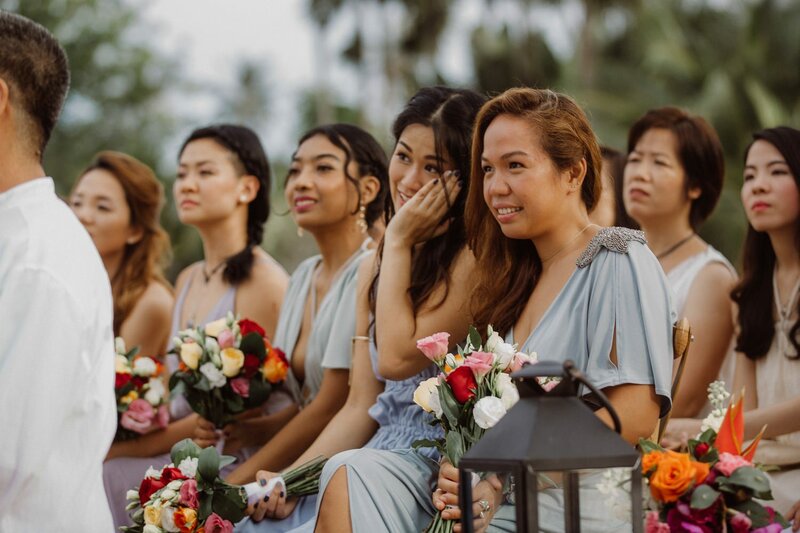 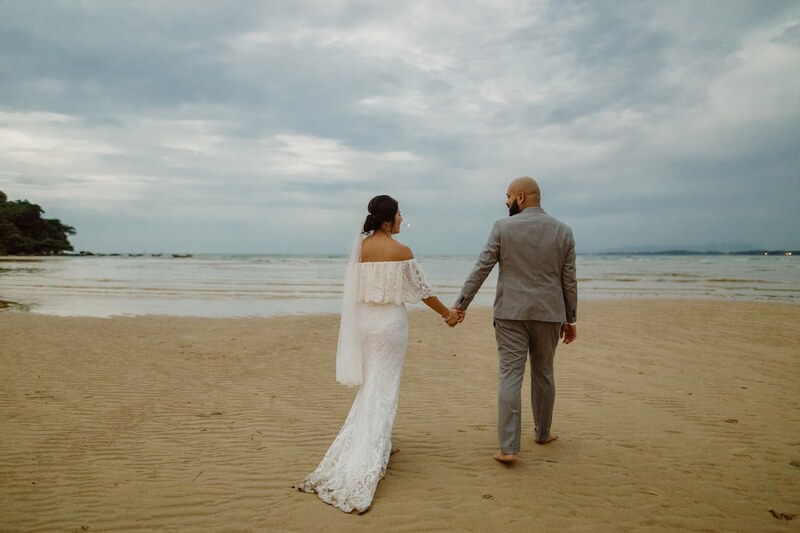 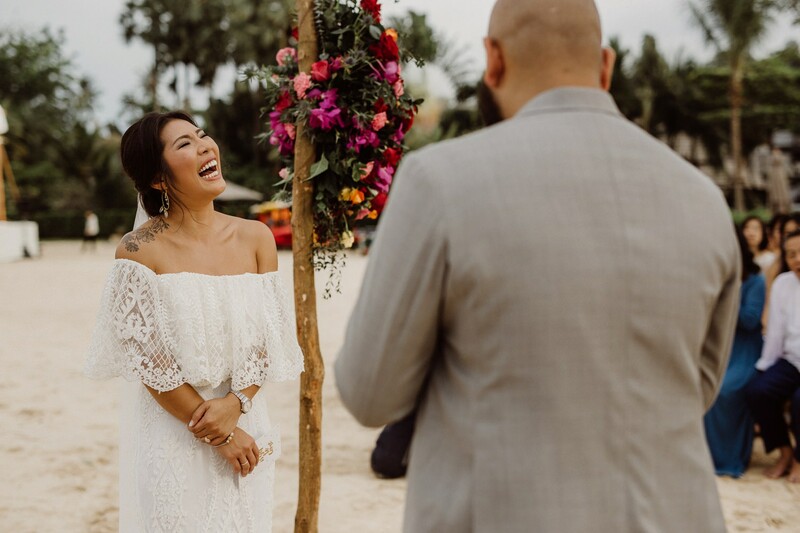 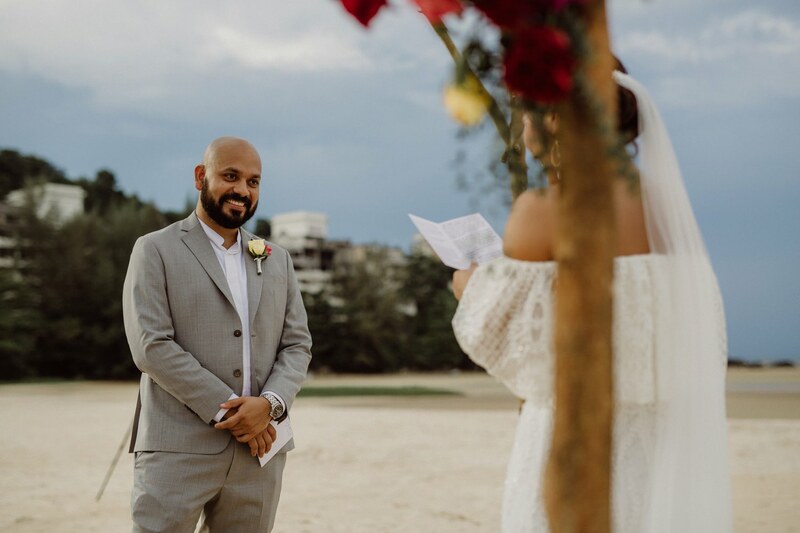 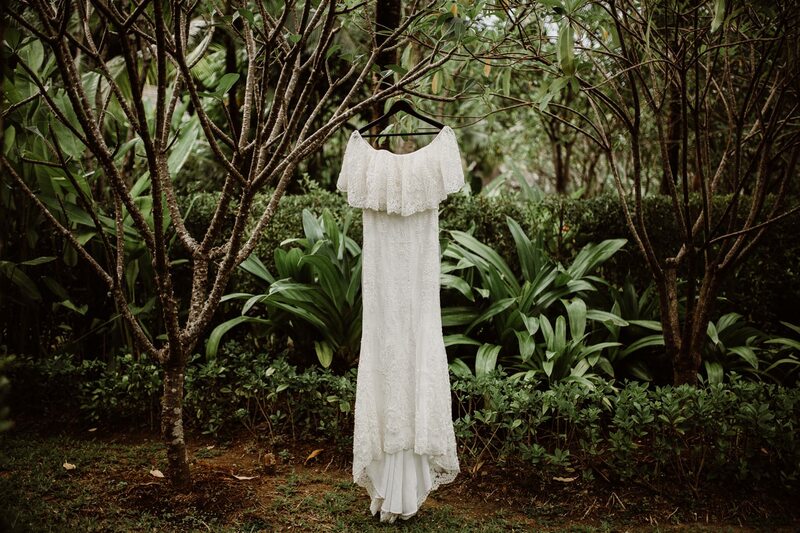 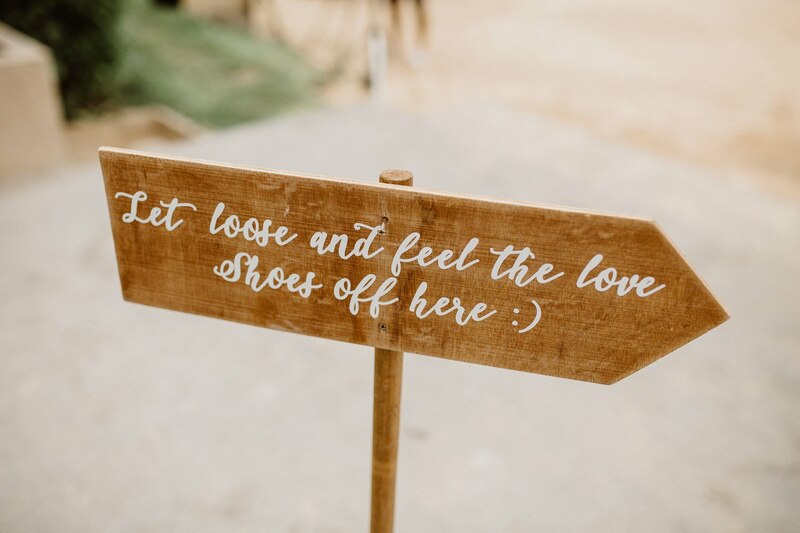 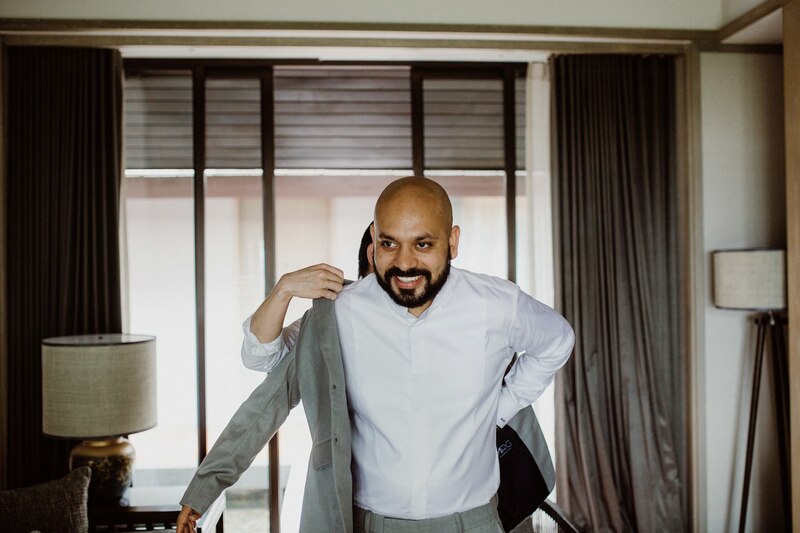 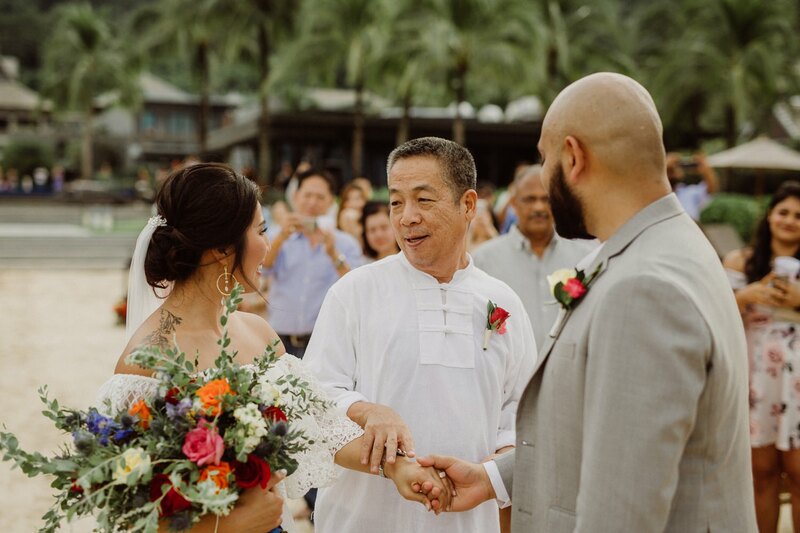 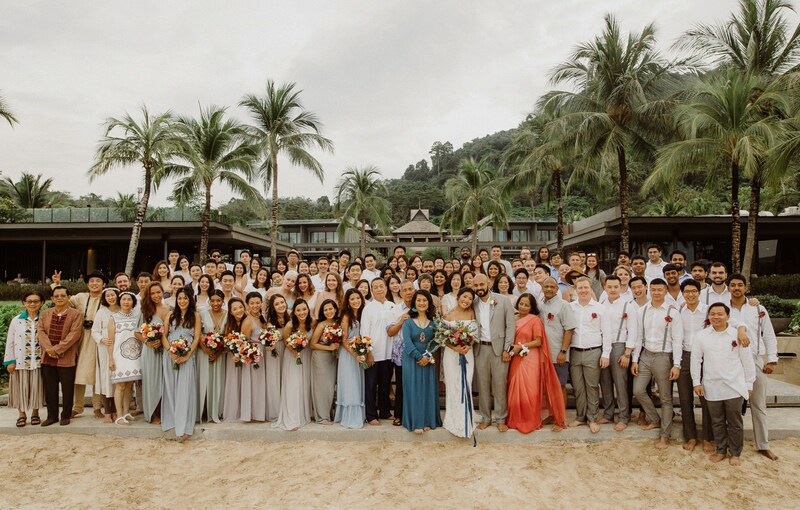 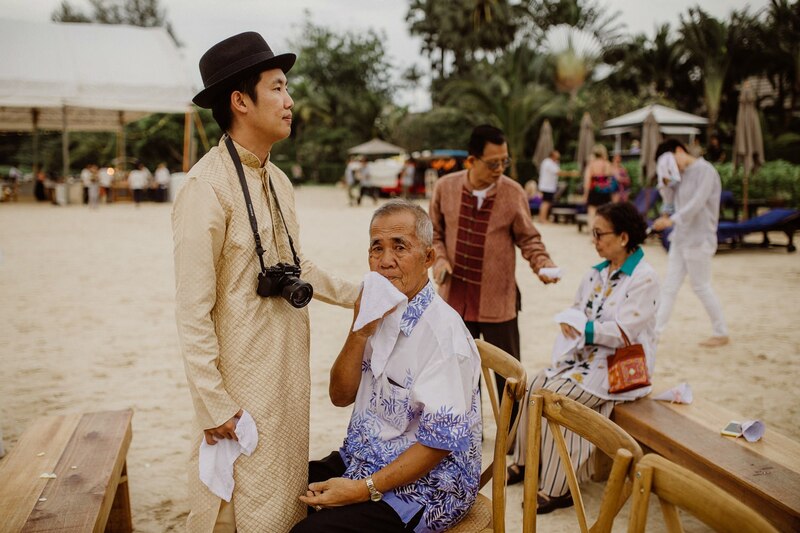 They chose Thailand and Marriot resort in Phuket to be the background for their rustic wedding on the beach and decided to keep it very light and breezy. 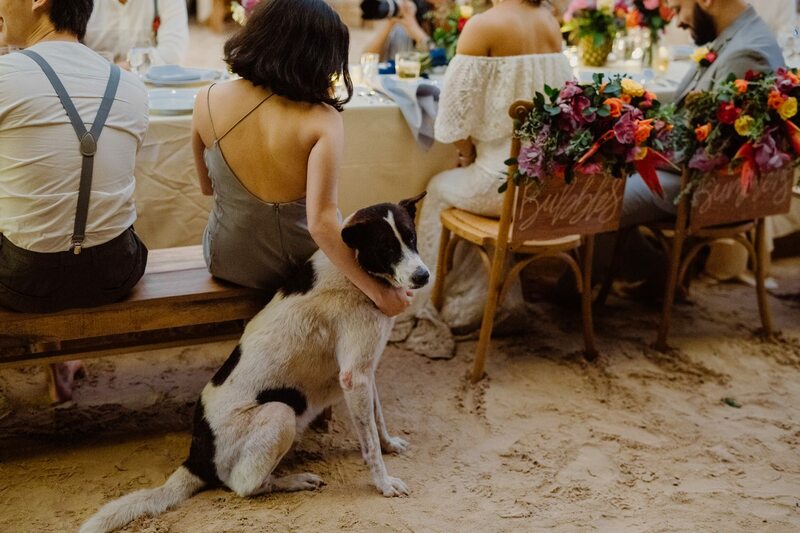 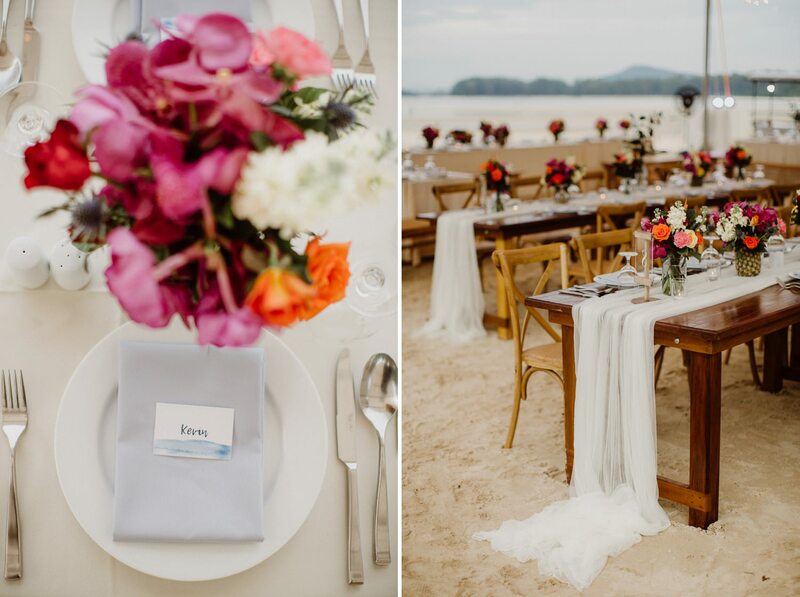 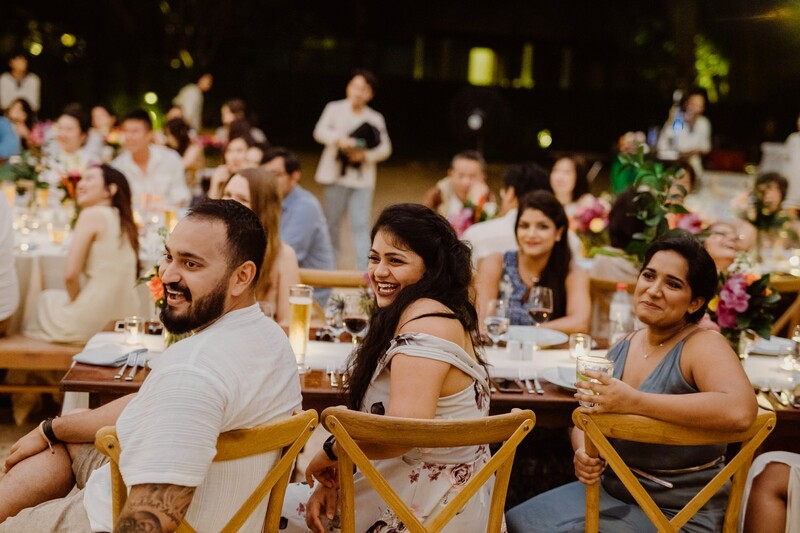 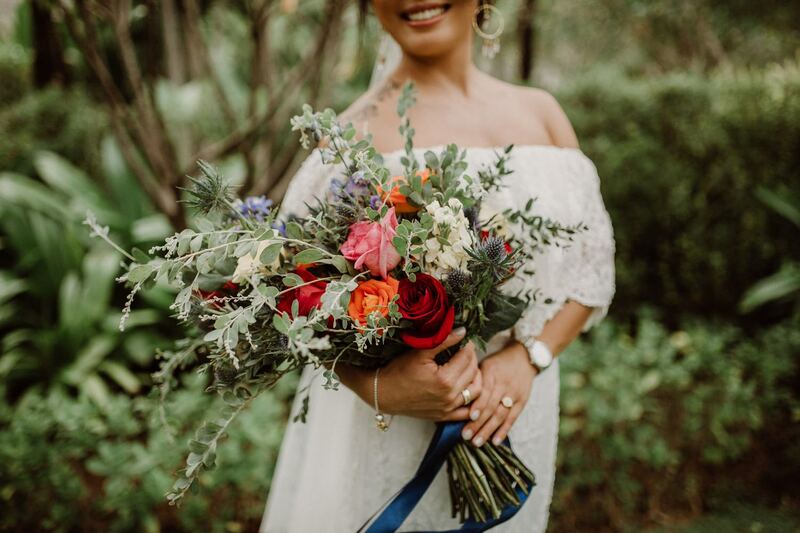 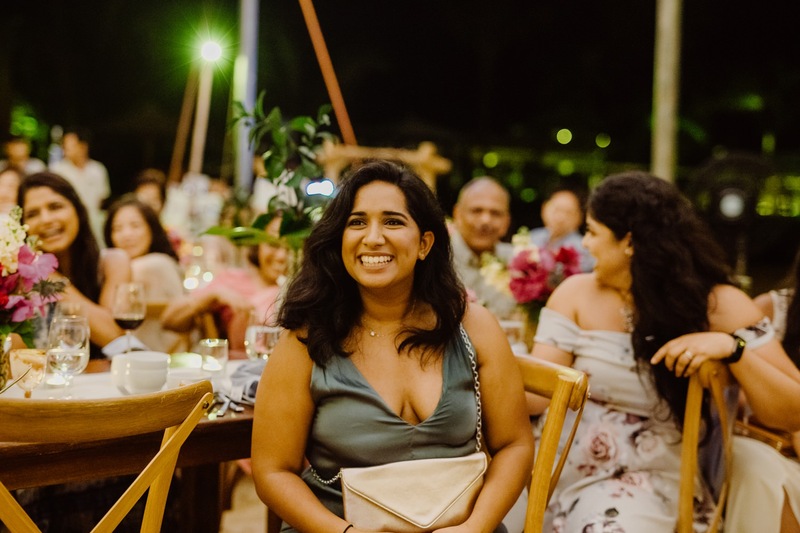 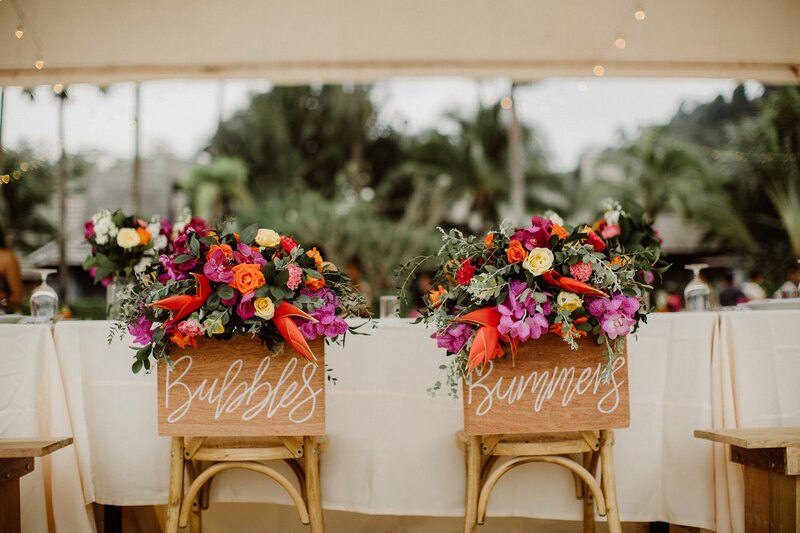 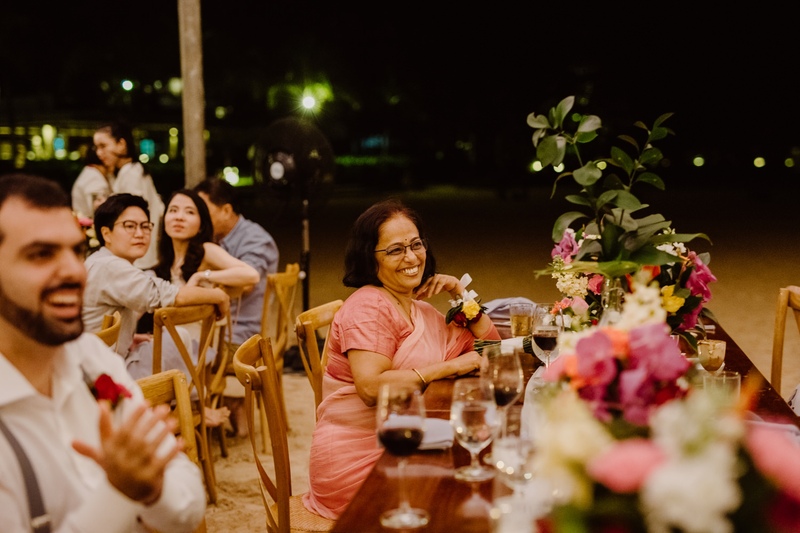 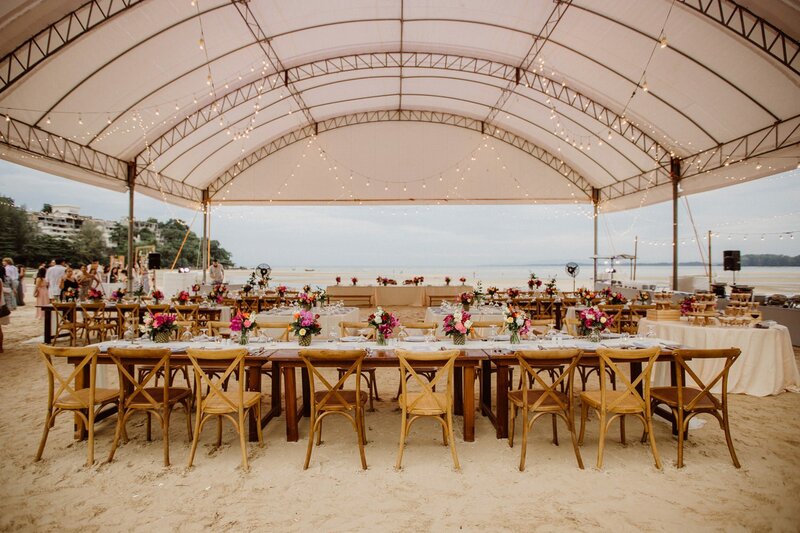 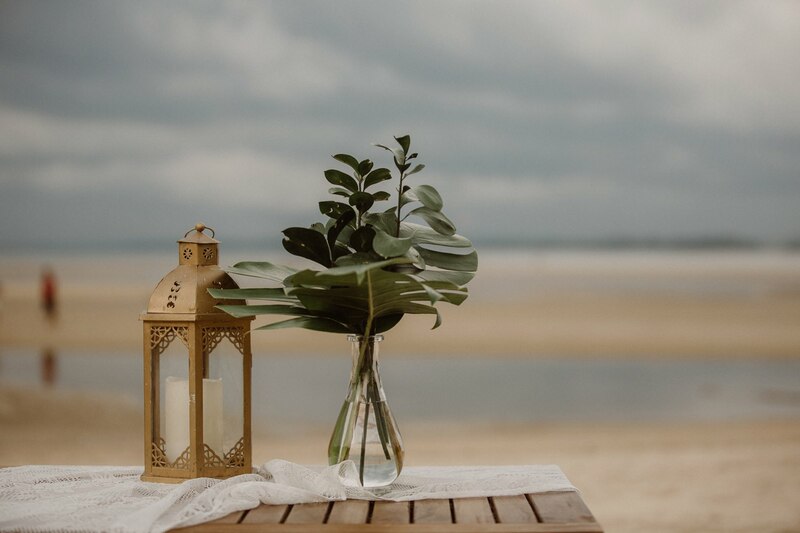 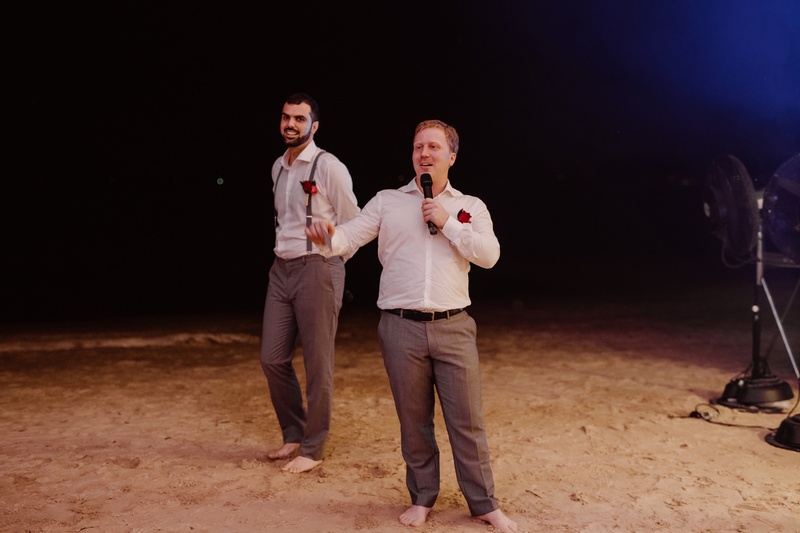 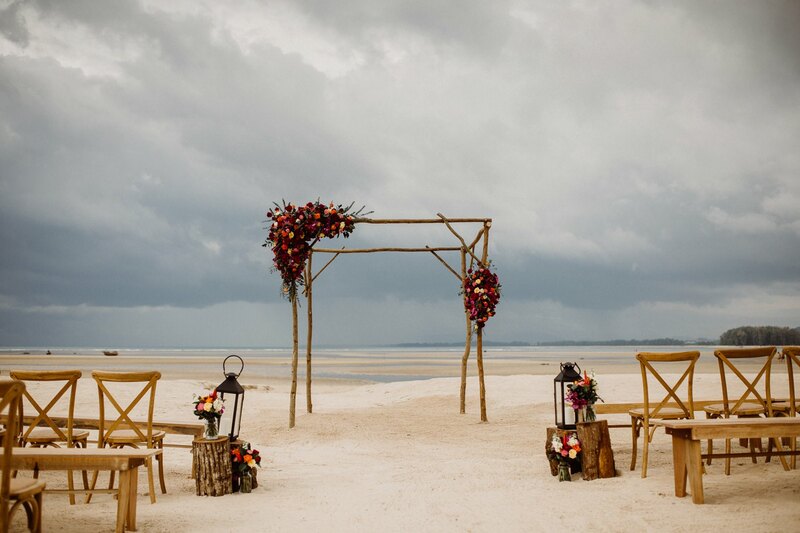 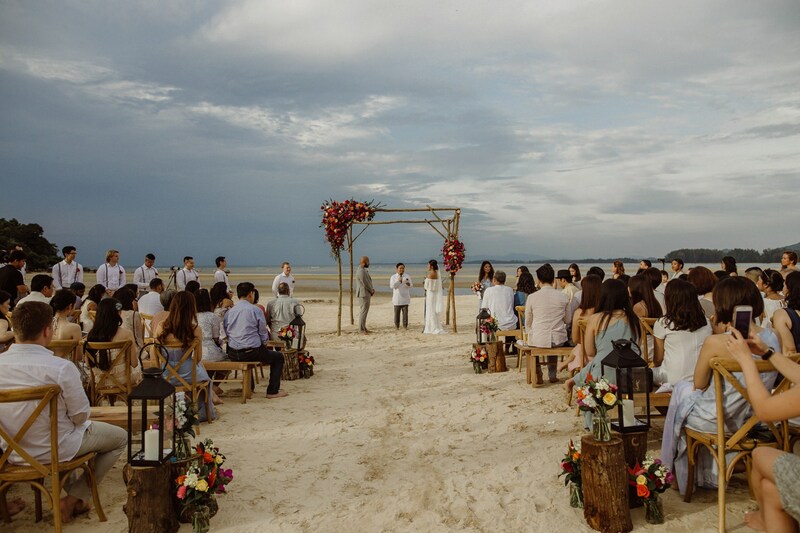 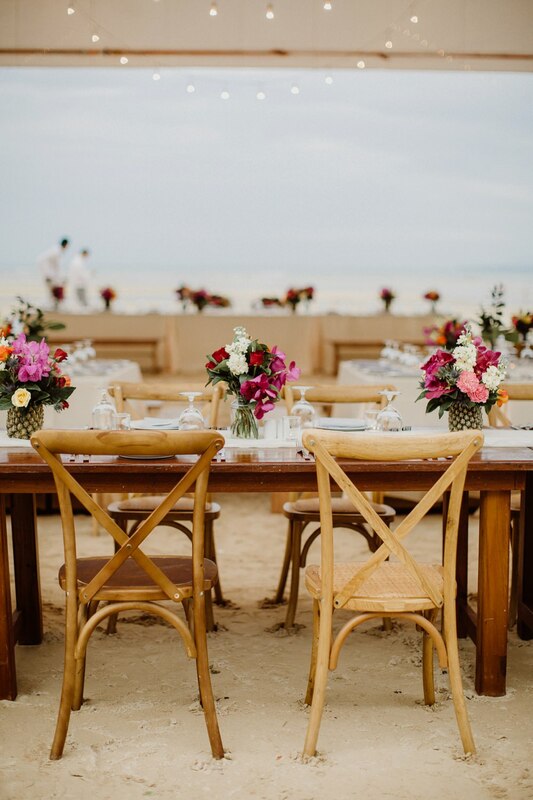 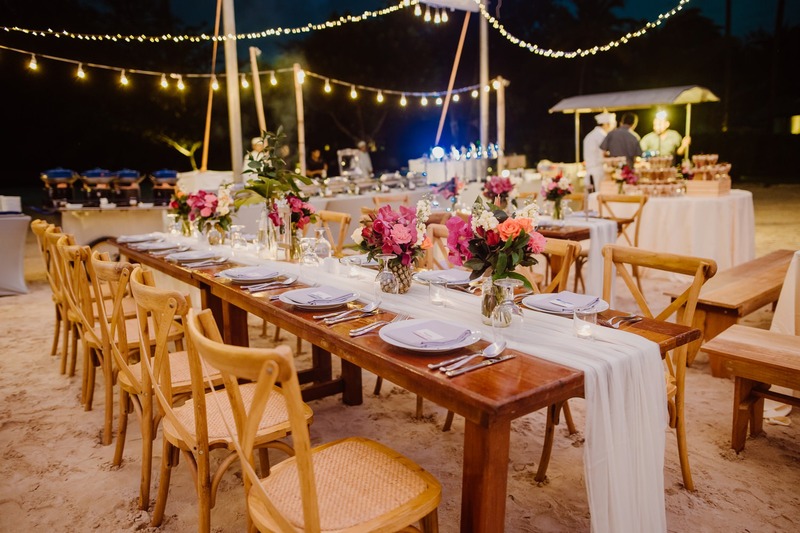 A beautiful flower arrangement on the beach, barefoot guests, bottles with sitting arrangements, wooden chairs and pastel colors are only a few things that made this wedding really lovely. 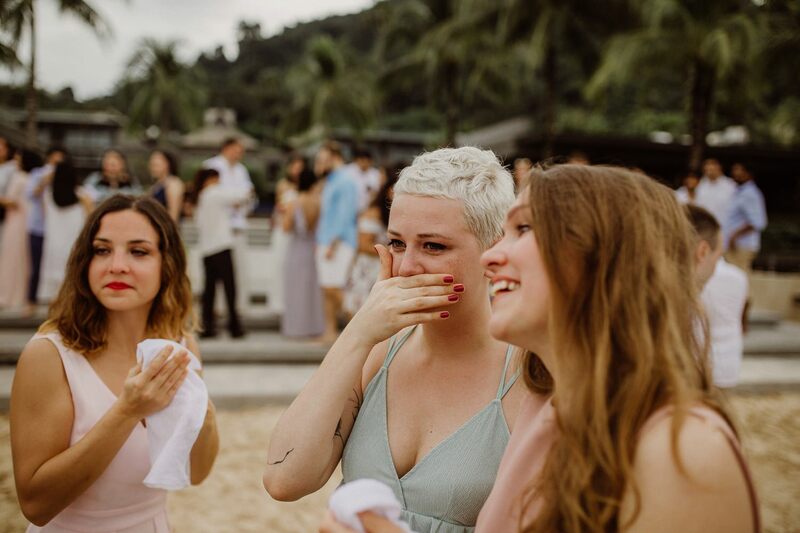 The ceremony part is always the most emotional part of the wedding and even though their special moment brought quite a lot of tears out in the open, it also sparked up lots of laughter. 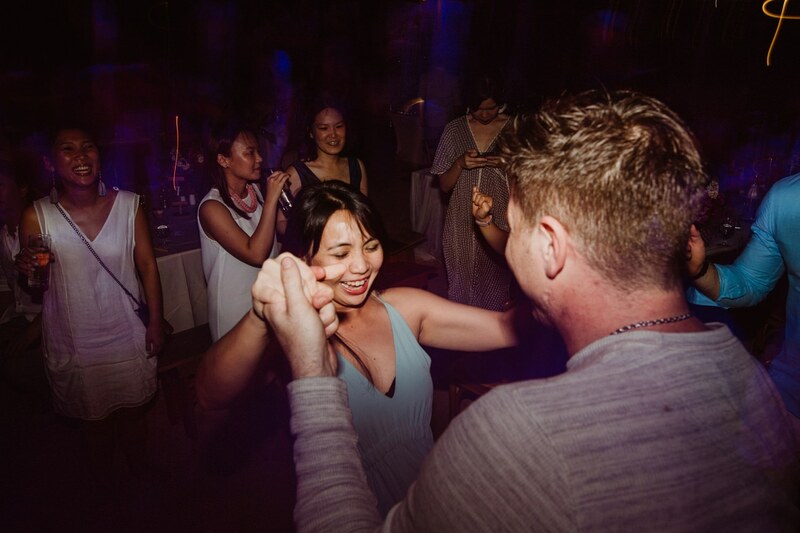 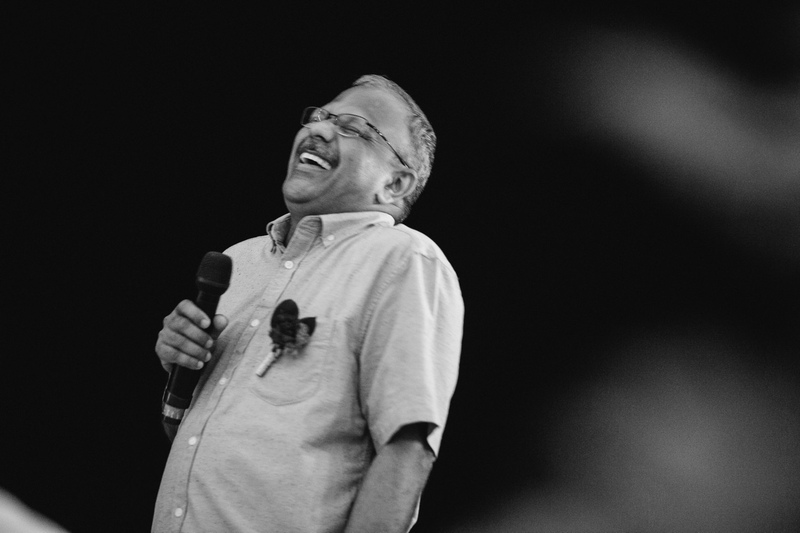 You could really feel the good energy and love flowing all around. 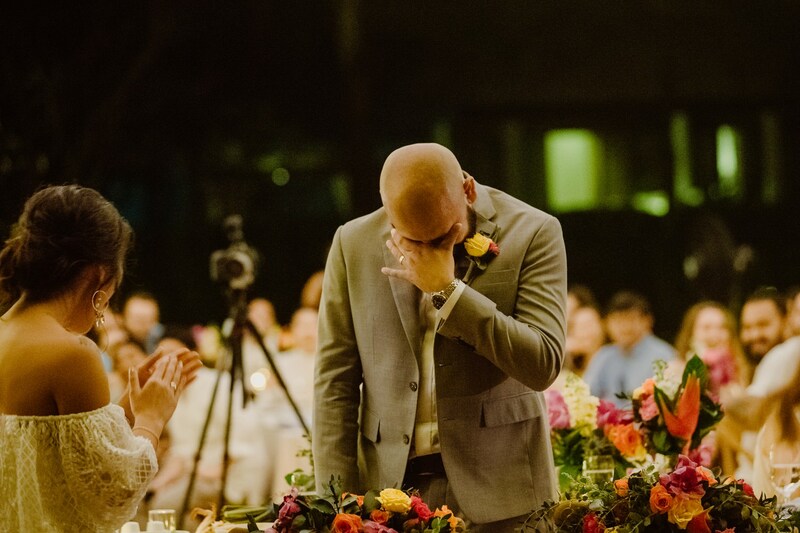 I have to admit that it was emotional even for me. 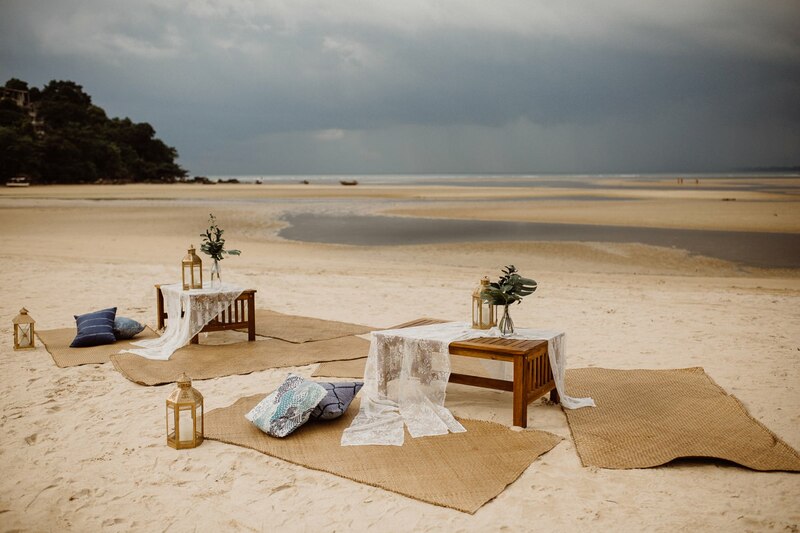 The sea remained our background as we sat down for dinner right there on the beach with our feet in the sand. 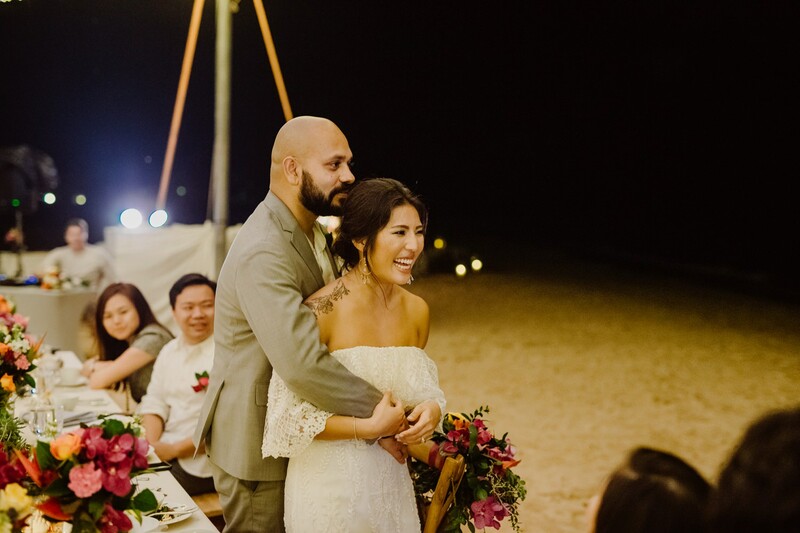 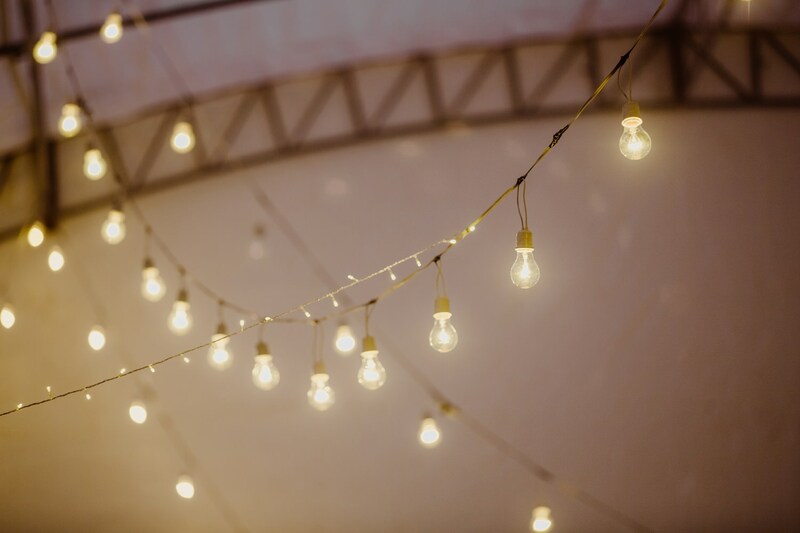 With the light breeze in our hair and love in the air, the night really became magical. 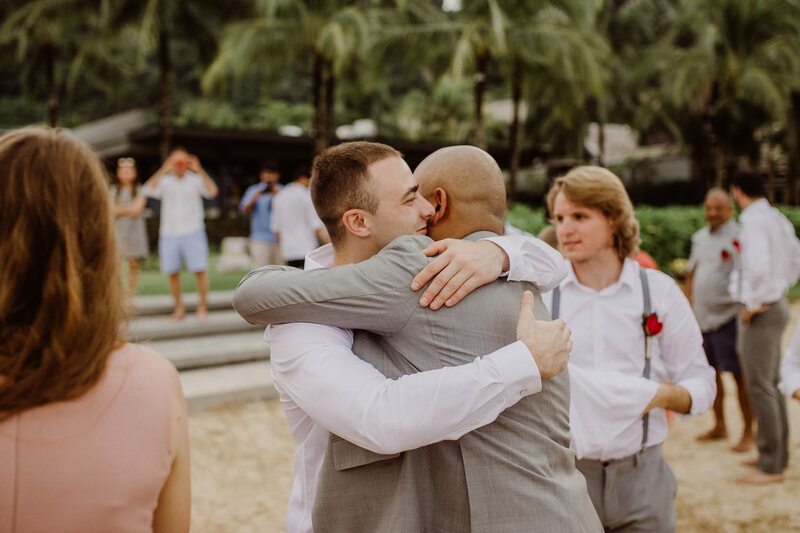 And when Tarn made a speech and thanked me for being there that day, I was touched and left speechless. 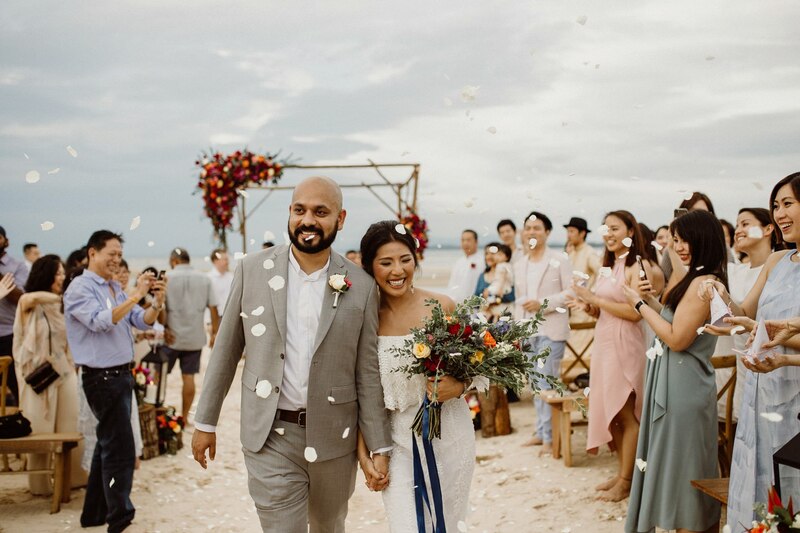 It really was a wonderful wedding, not just a day when two people became husband and wife but a day when love conquered everything.